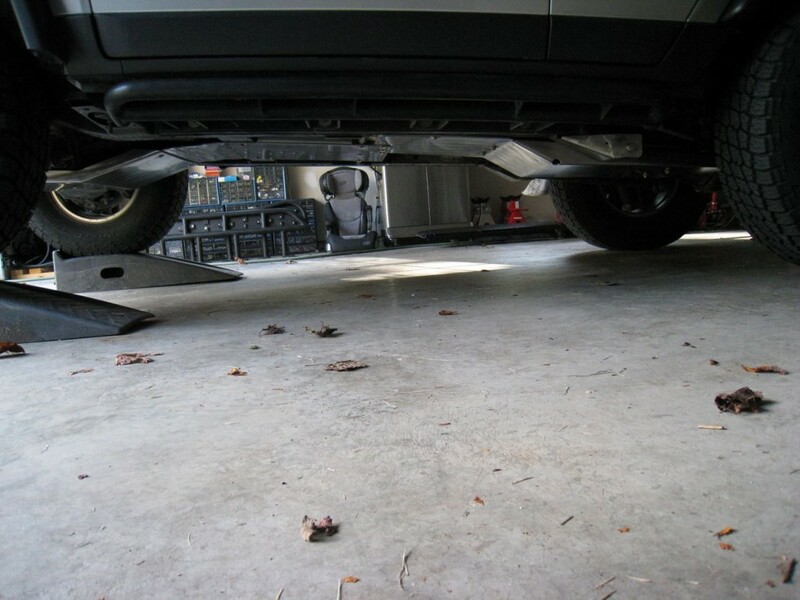 October of 2009 was a great month for my FJ Cruiser, and probably one of the most significant in terms of upgrades. I had spent the previous month or so analyzing my FJ’s performance characteristics in great detail in an effort to determine my next upgrade path. One of the immediate drawbacks to note was performance on inclines. 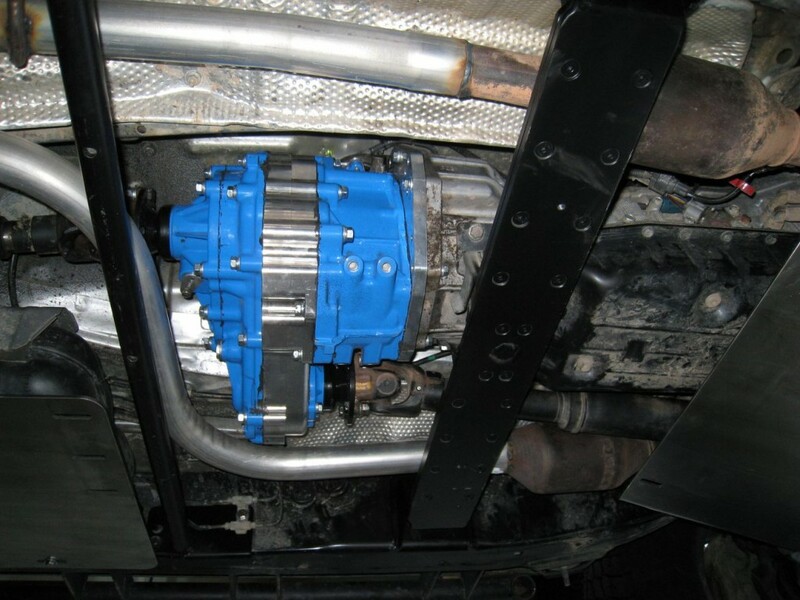 Although the FJ comes stock with a 2.56:1 transfer case gear ratio, the gearing even in LOW/LOW leaves a lot to be desired when it comes to steep hills. 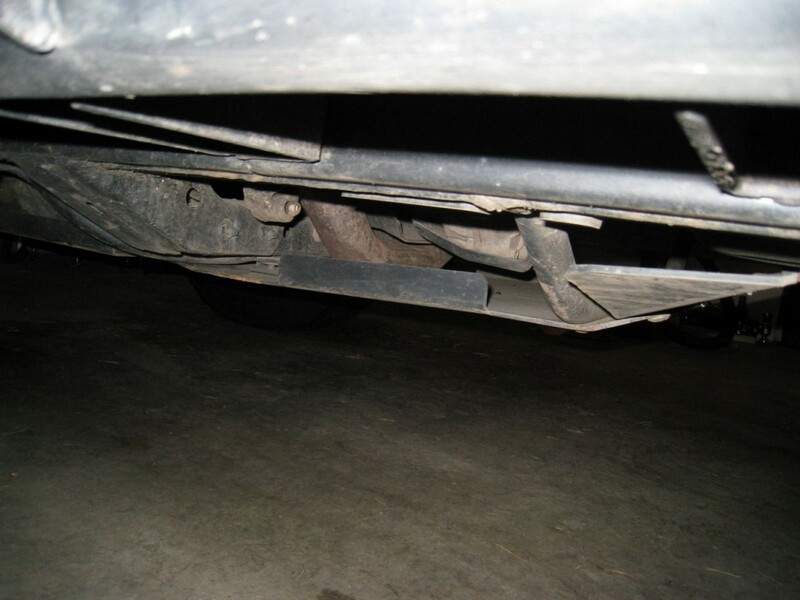 Extremely rocky terrain can also prove frustrating since drivers can find themselves in constant “brake” mode, where their foot never leaves the pedal. On flat terrain, riding the brakes can indeed be an effective method for controlling forward momentum. 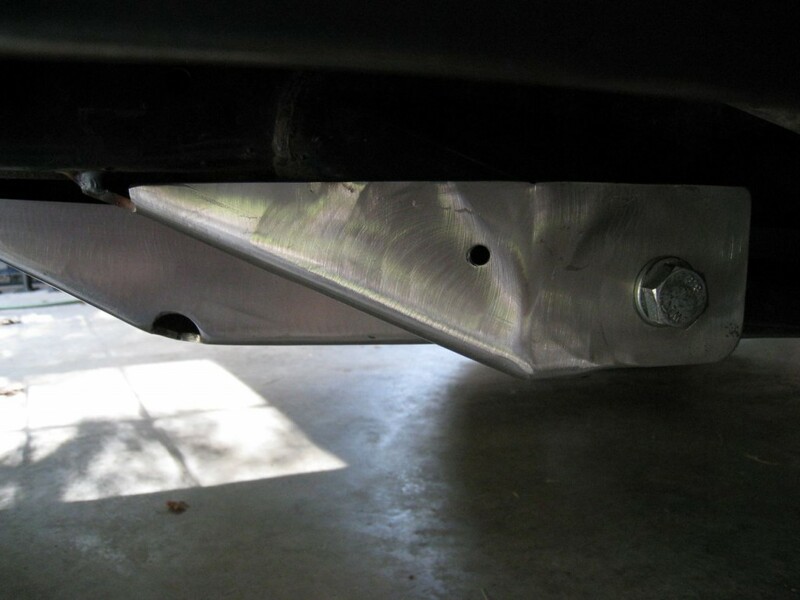 But on inclines where the surface is loose or slippery, hitting the brakes can lead to disastrous results. 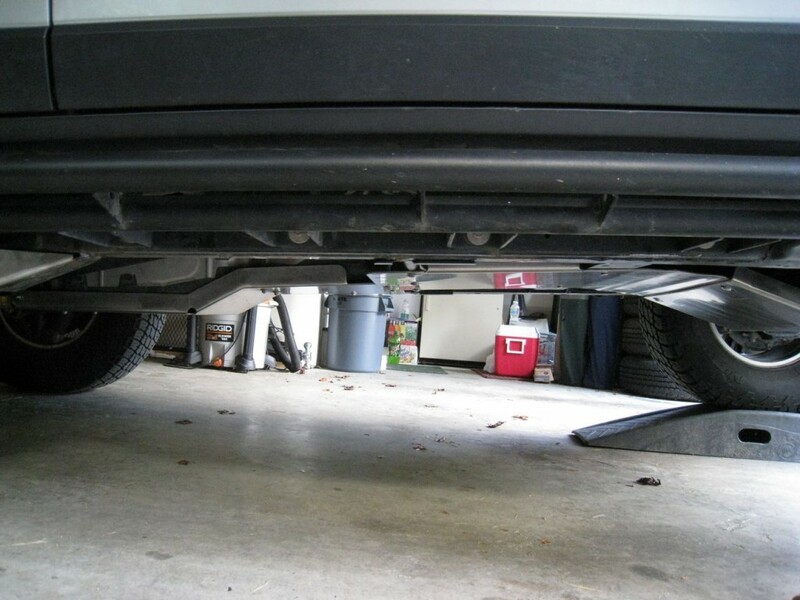 The question is, what can FJ owners do to improve this situation? 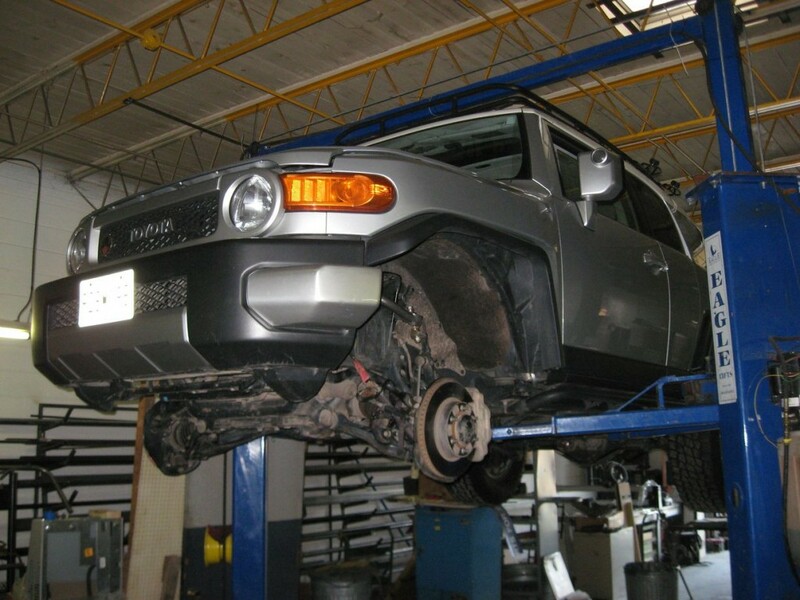 There are several possible solutions to this issue, many of which involve rather significant modifications to the FJ Cruiser’s drive train. 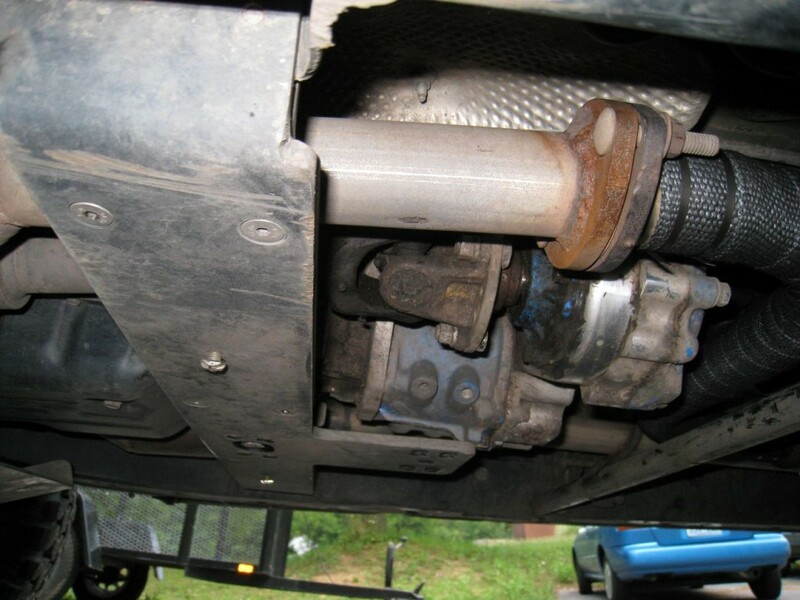 But one of the best solutions available for FJ Cruiser owners is the Inchworm Lefty transfer case. 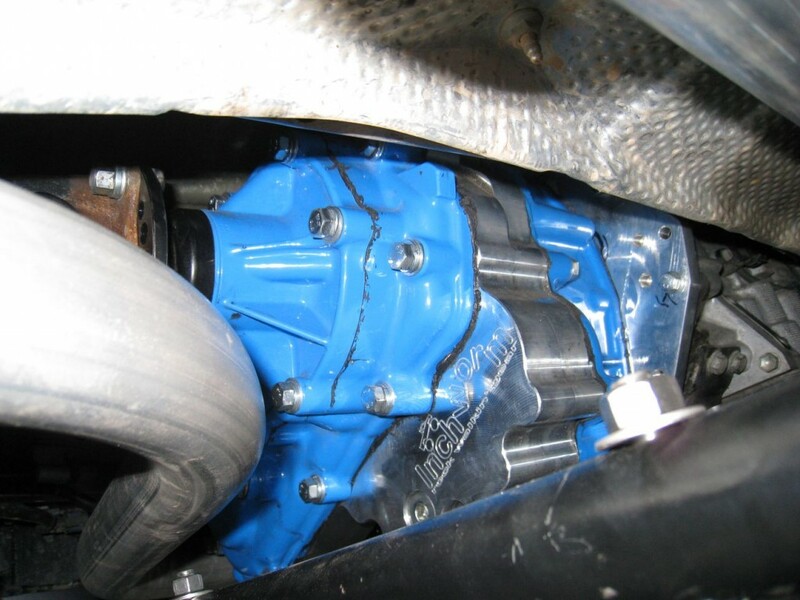 The Lefty is a left-hand drop, gear driven transfer case that comes standard with a 4.7:1 gear ratio, cutting your crawl speed nearly in half when compared to stock. 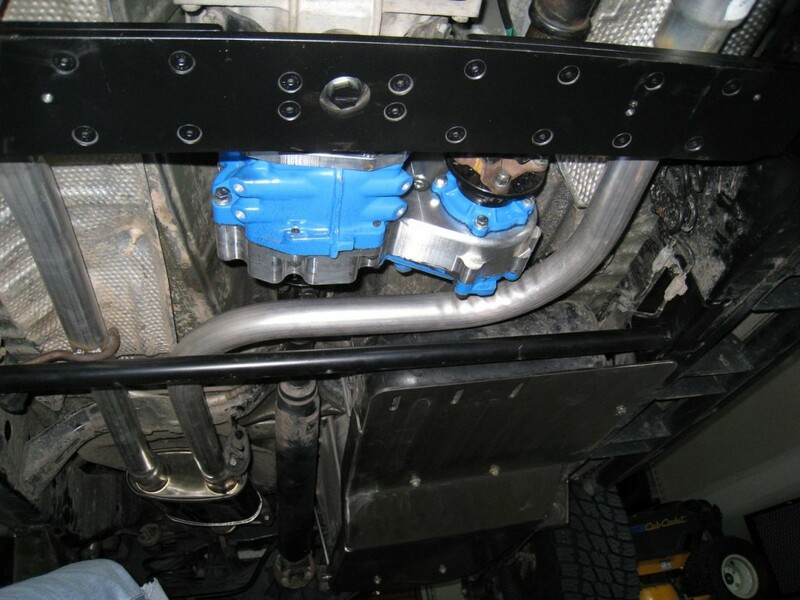 The Lefty is designed to replace the stock transfer case, but it only requires a few minor modifications to the stock shifter and some wiring, making it one of the easiest upgrades to implement. 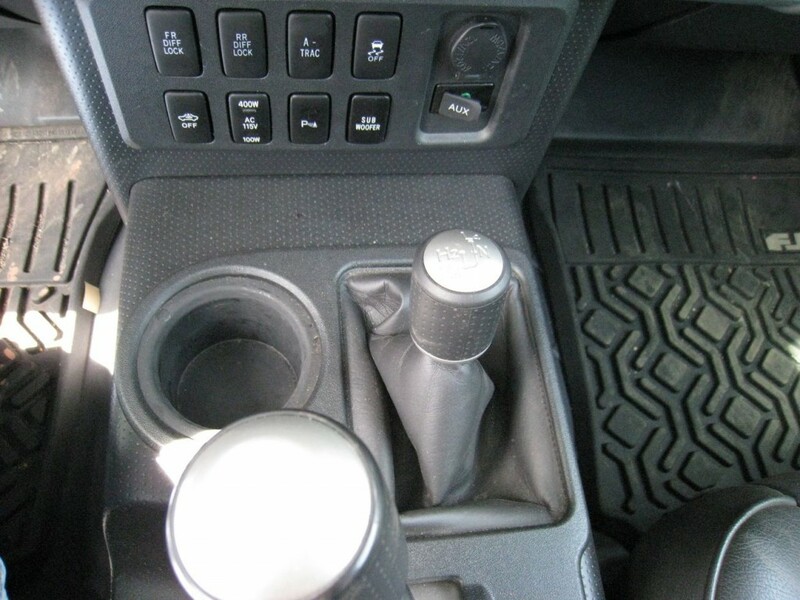 Standard shifter configuration is a single stick. 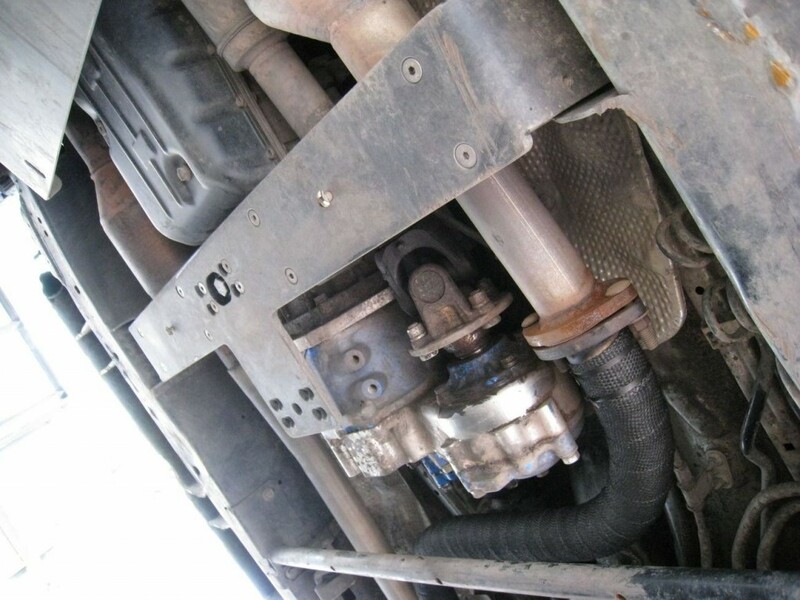 But Inchworm also offers the Lefty in a twin stick configuration, allowing operators to achieve a low gear ratio in either 2- or 4-wheel drive. 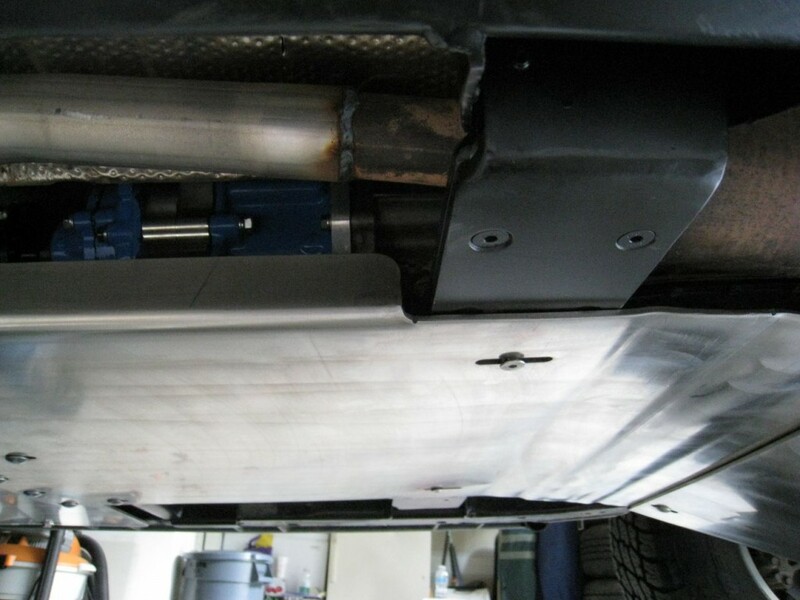 As an added bonus, the FJ gains access to A-TRAC and rear locker capabilities in both high and low range once a Lefty is installed. 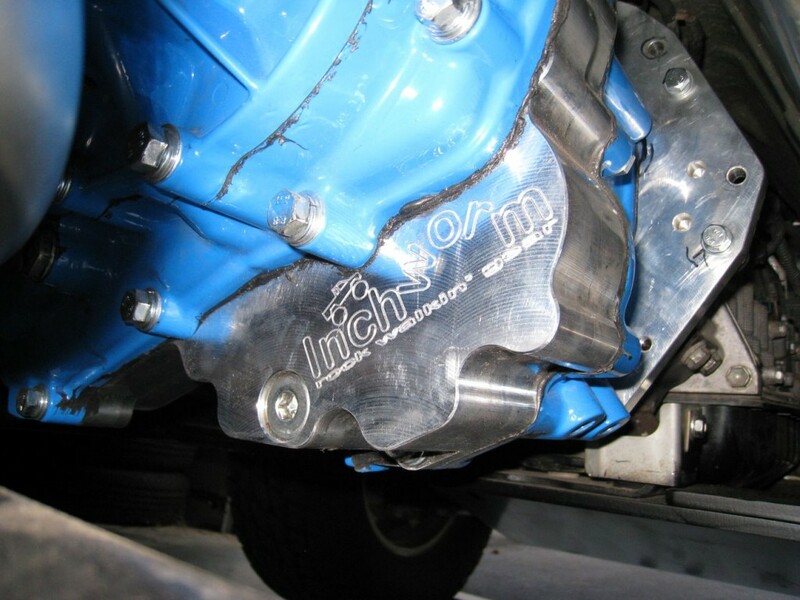 Lastly, the size and clocking of the Inchworm Lefty transfer case allows for nearly four additional inches of clearance under the vehicle. 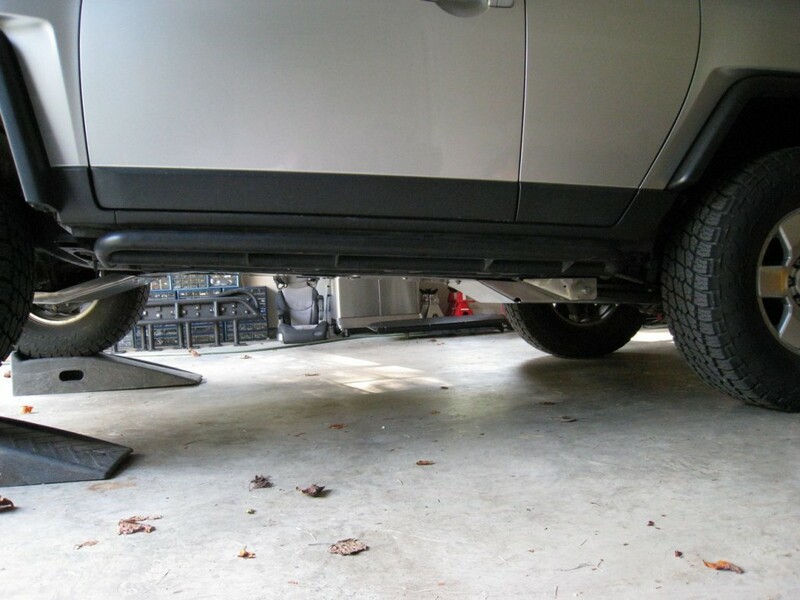 This makes a big difference when traversing larger obstacles and clearing steep hills. Based on all the above factors, I finalized my decision, selecting the Inchworm Lefty as my upgrade of choice. The only trick at that point was the installation itself. 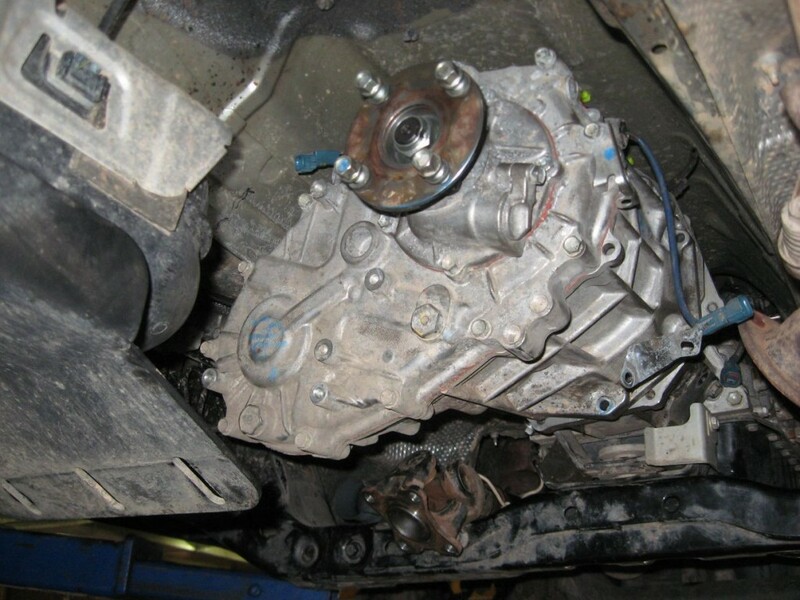 I’ve taken on some decent mechanical projects in my time, but nothing quite to the extent of replacing a transfer case. So I began looking for a reputable shop nearby that could do the work. 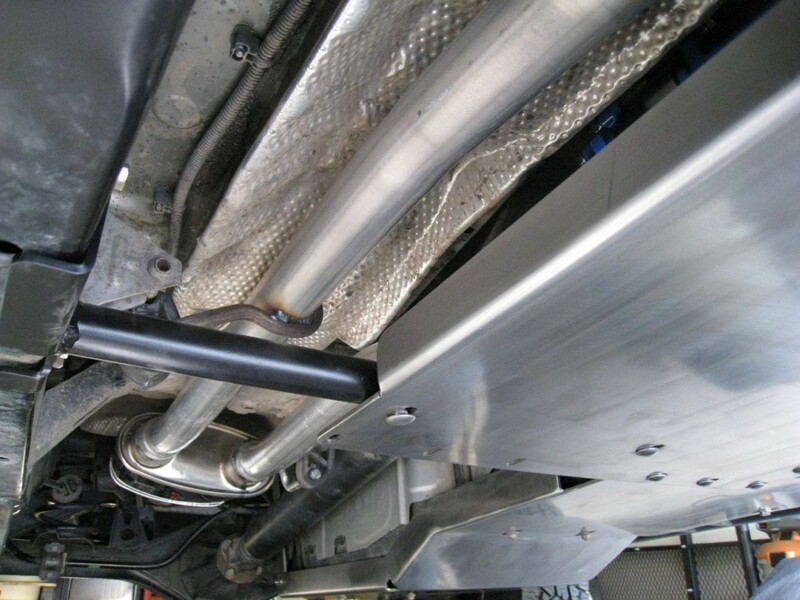 As luck would have it, Bud at Budbuilt was offering a complete Inchworm Lefty installation package known as the “Tummy Tuck” – to include not only the Lefty, but also a custom cross-member, high-clearance skids and custom modifications to the stock exhaust system. It sounded like the perfect solution, so I contacted him over the phone and made arrangements to drop off the FJ in his native town of Lenoir, North Carolina. It was a bit of a drive for me but well worth the time to get an upgrade this cool. I took the below shots right before our trip to Bud’s, prior to any tummy tuck modifications. 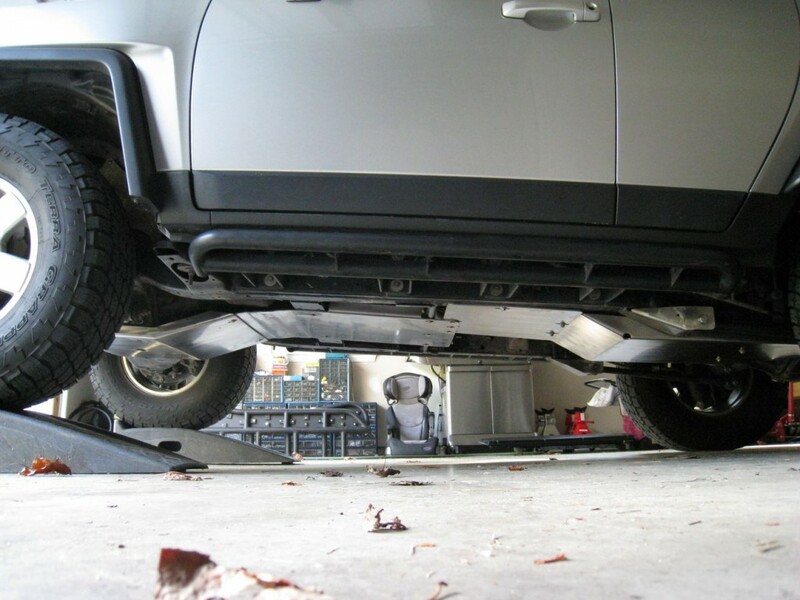 At the time of these photos, the FJ was sporting a full set of Budbuilt powder-coated skid plates. Ample rust, dirt and scratches aside, the skids in these pictures provided excellent protection during my excursions and expeditions. 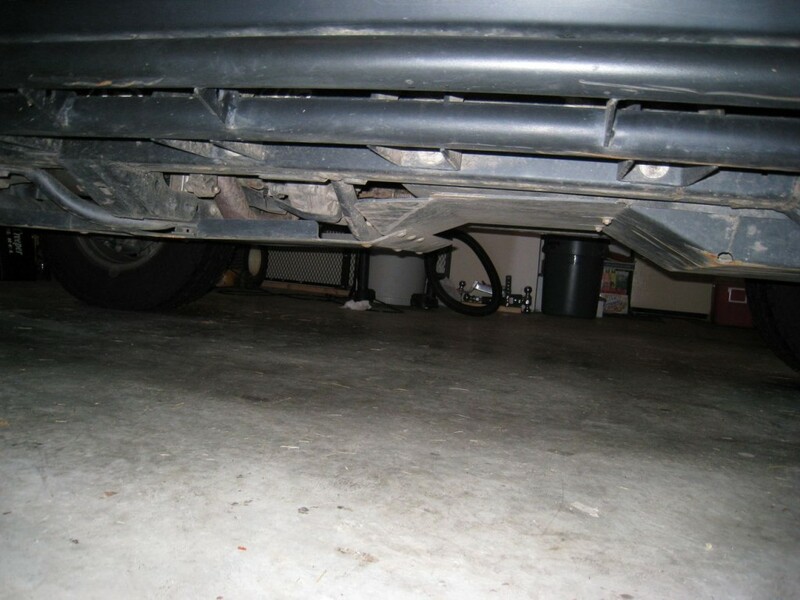 Just above the skids, if you look a little closer, you’ll note the large and low-hanging cross member used to support the stock transmission. 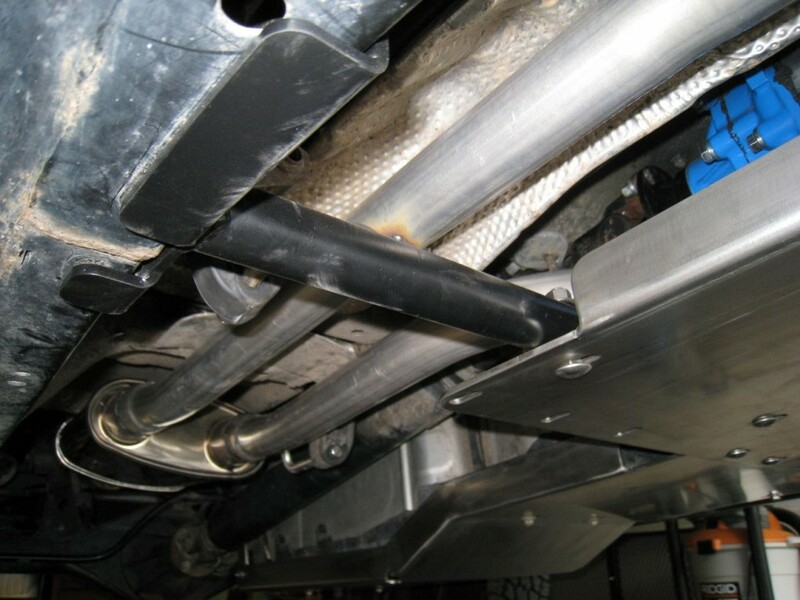 This monster, along with the frame support brackets and low-hanging exhaust pipe, are a big reason for doing this upgrade. 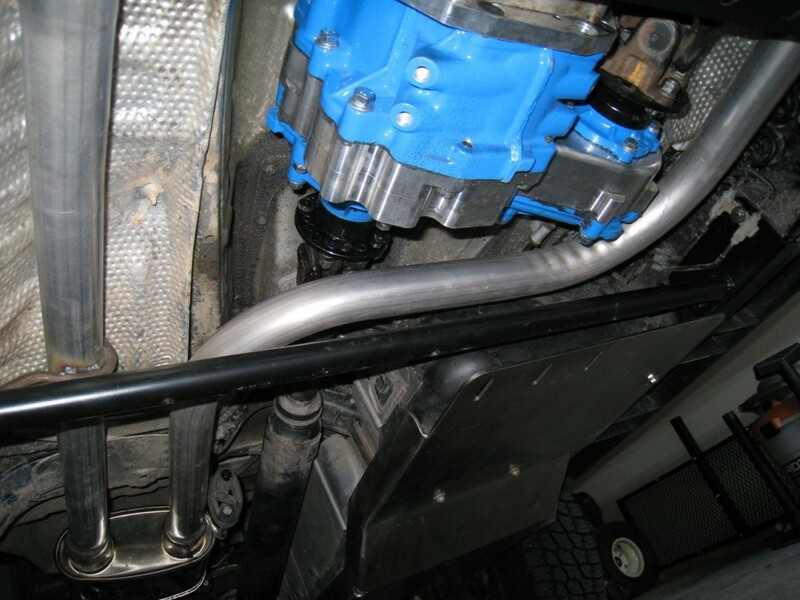 By replacing the stock transmission support with a Budbuilt cross member, the FJ gains almost 4″ of breakover angle clearance. 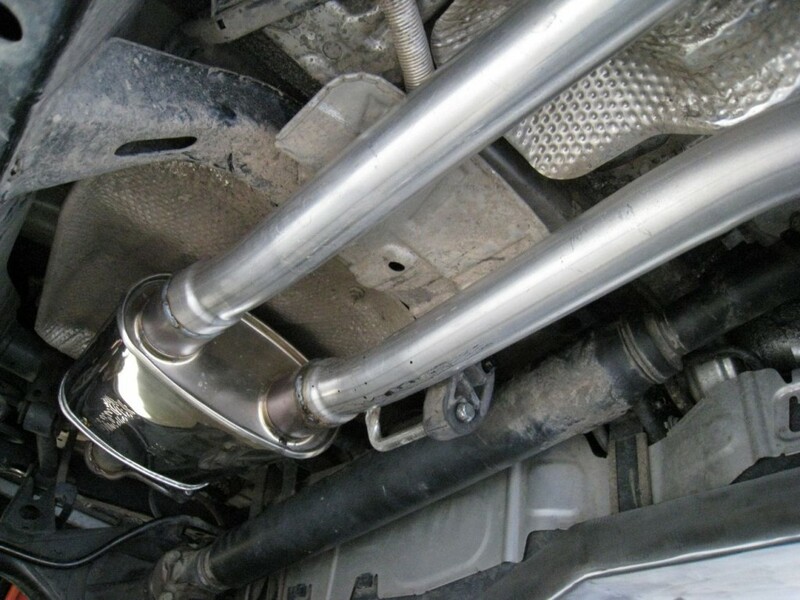 And the modifications made to the existing exhaust system allow your FJ to breathe more easily since the cross-over pipe is no longer pinched. 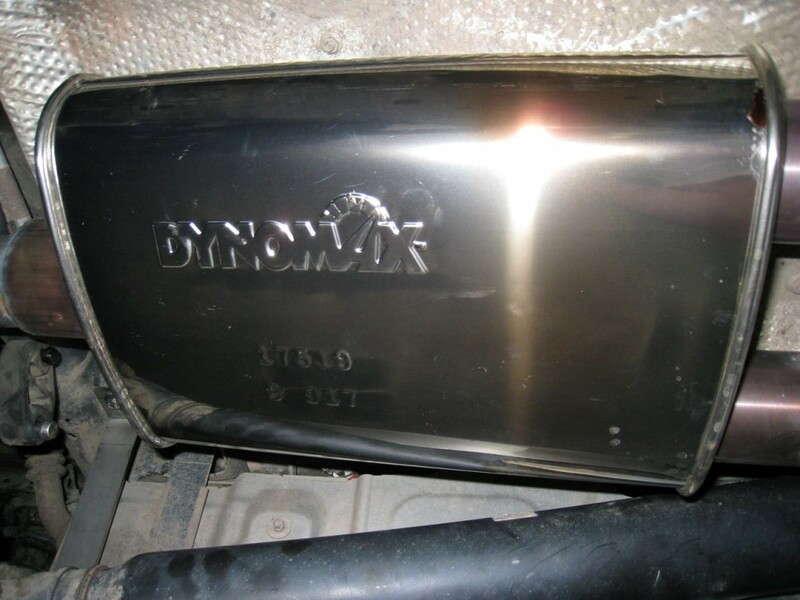 Speaking of the exhaust, take a look at the stock muffler. I’m honestly amazed that it lasted as long as it did considering it’s location and size. 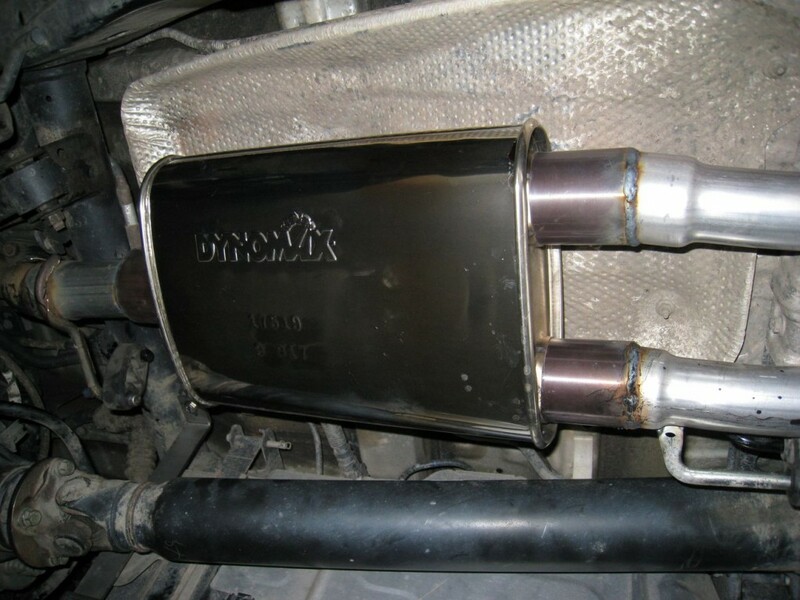 The over-sized stock canister muffler will also be replaced during this procedure. From northern Maryland, it took about 8 hours of southward driving before my wife, daughter and I finally had the pleasure of meeting Bud in person. And I have to say, what a great guy – ultra-friendly and very down to earth – Bud welcomed us like members of his own family. We spent several hours touring his shop, meeting other family members and getting all the details on what was involved with a standard tummy tuck procedure. 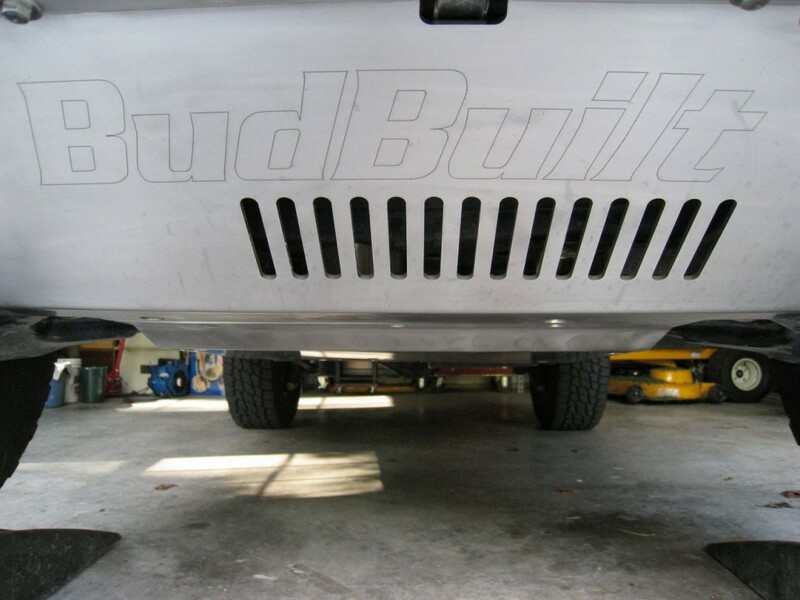 For those of you who may not know, Budbuilt is a family owned business that Bud started himself back in 1999. 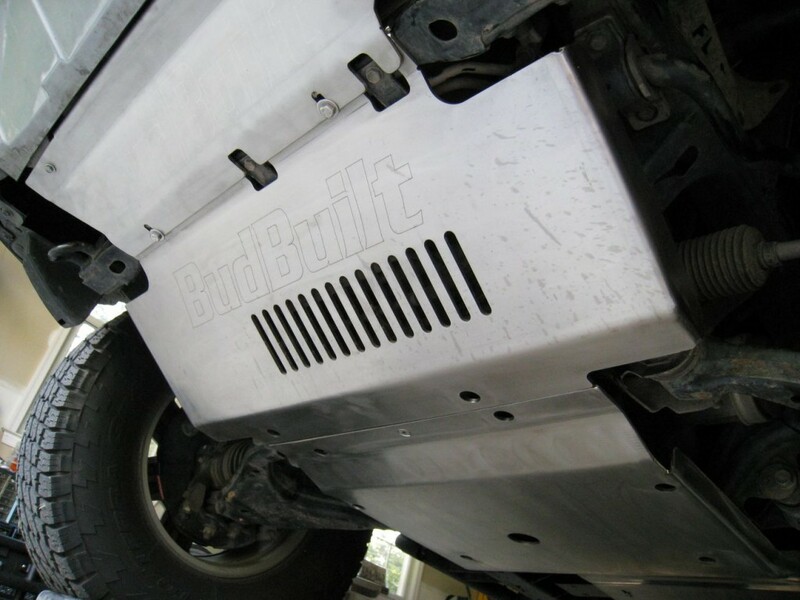 By combining more than 20 years of mechanical engineering background and an undying enthusiasm for off-roading, Bud has managed to build a very successful business. We’ve had a lot of dealings since this first meeting, and I can honestly say I don’t think I’ve ever met a nicer or more personable individual. As a businessman, Bud knows his products and absolutely excels at customer service – bending over backwards to achieve the impossible at times in order to ensure his customers are always satisfied. And as one of many customers, I was no exception to this rule. Because our arrangement was somewhat last minute due to prior commitments on my end, I decided to part with my FJ for several weeks rather than just a few days. 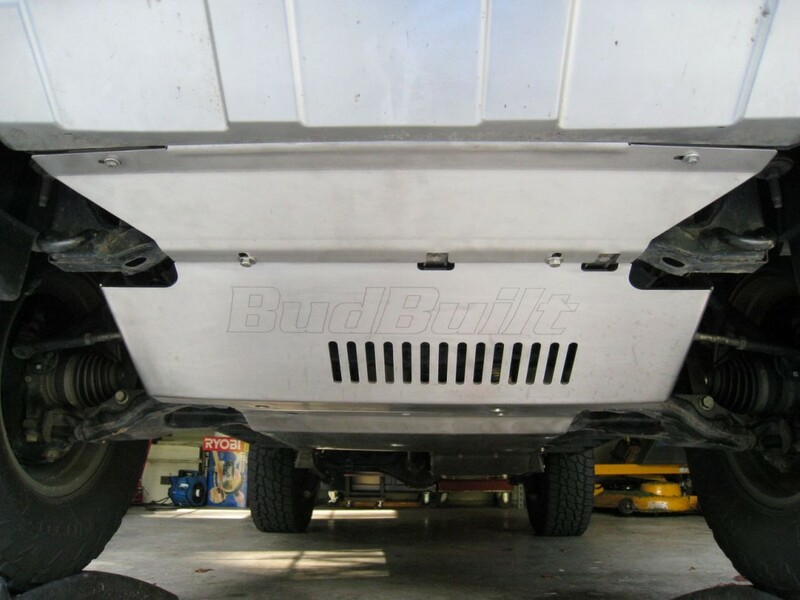 This not only gave Bud time to complete the tummy tuck modifications, but since Bud didn’t have immediate access to an FJ Cruiser, it also provided an opportunity to engineer some new parts and components for the FJ community in general. So I was more than happy to give up my favorite ride since it meant potential new products down the line. 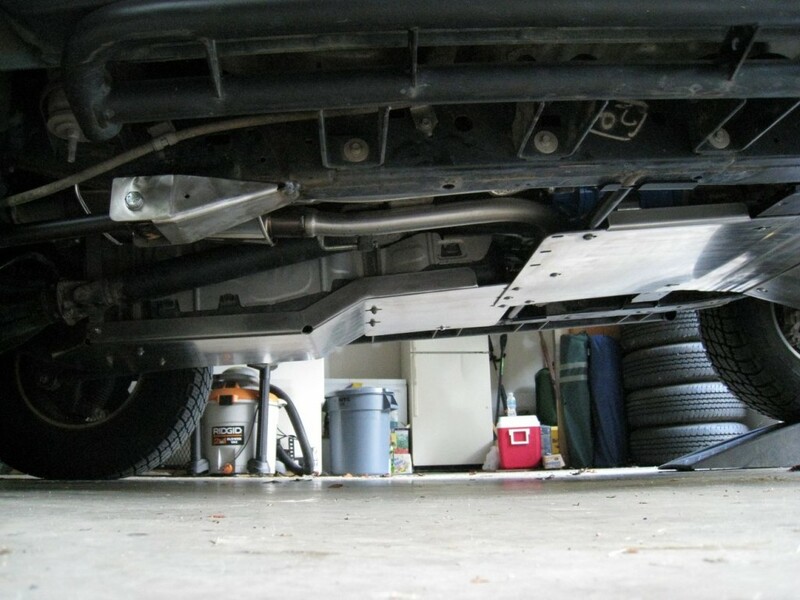 Since I wasn’t present to help or directly witness all the modifications, I think much of this story will have to be told using pictures that were taken before, during and after completing the installation. So let us dive right in, shall we? It wasn’t long after we returned to Maryland that Bud began sending updated photos of his progress. The photos I received were a combination of tummy tuck progression and new product prototype designs. With each new photo I became more and more excited, witnessing the build-up from afar. Due to Bud’s overwhelmingly busy schedule, some of the items originally prototyped are still in development phase so I can’t share any of those photos just yet. 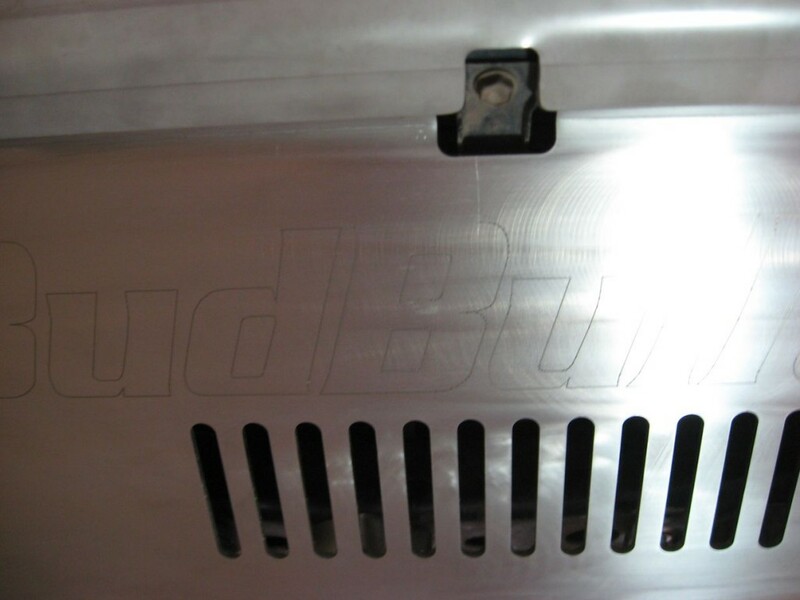 But there are a few things that have now been added to the main Budbuilt product list which I’ll share later on. 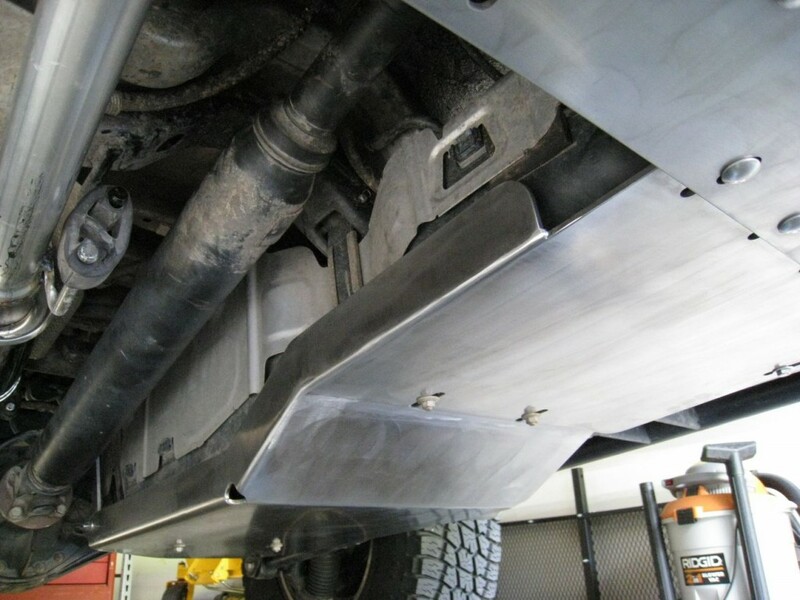 Most of the below photos concentrate on the underbelly of the FJ Cruiser and should give you a brief idea of what’s involved in this type of project. 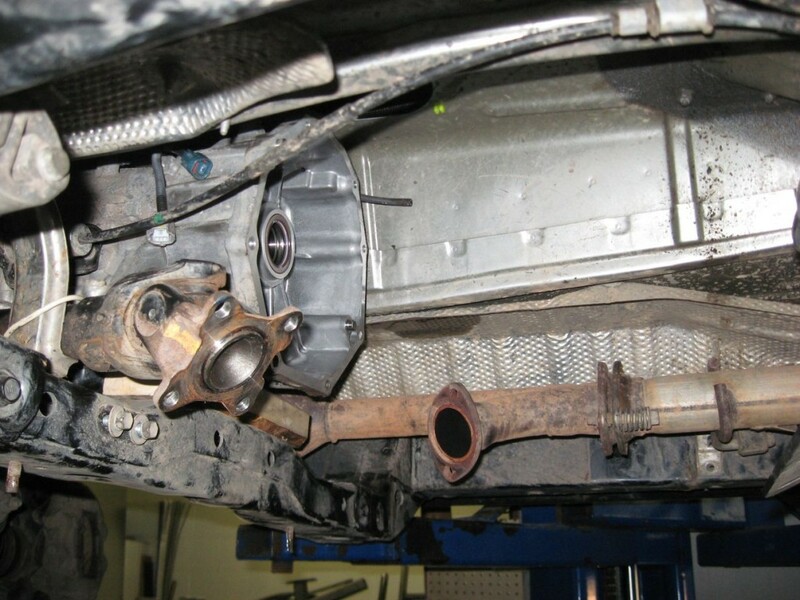 I should also point out that if you’re just looking for lower gearing, an Inchworm Lefty transfer case can be installed without replacing any of the stock support components or modifying the exhaust. But for me, the added benefits of a full tummy tuck were unquestionable. The pictures below are pretty self-explanatory but a few of them are more noteworthy. 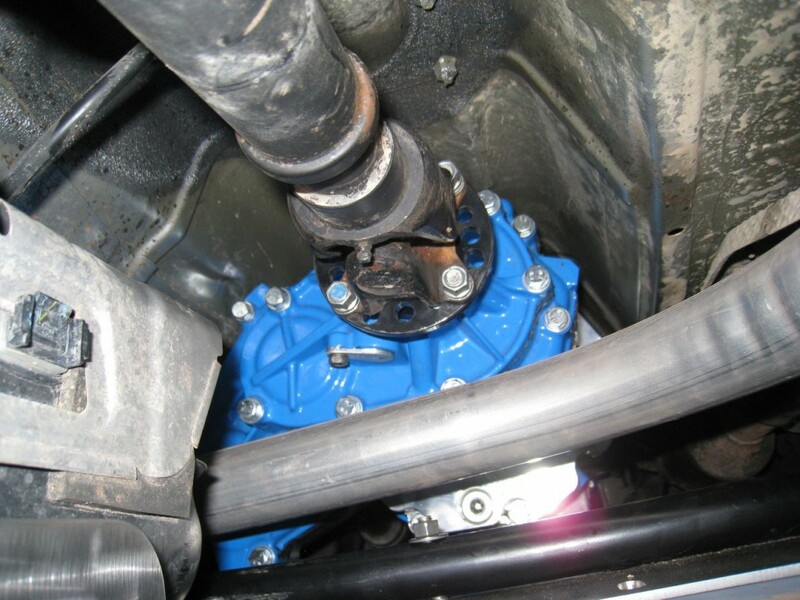 The Lefty transfer case does not contain synchronization gears so an add-on switch is required to simulate the stock shift-on-the-fly capability used in 4-wheel high gear. I ended up adding this switch to my center console. Taking a look at the last picture, you can see how Bud takes full advantage of the existing cross member by cutting at a very specific angle during removal. 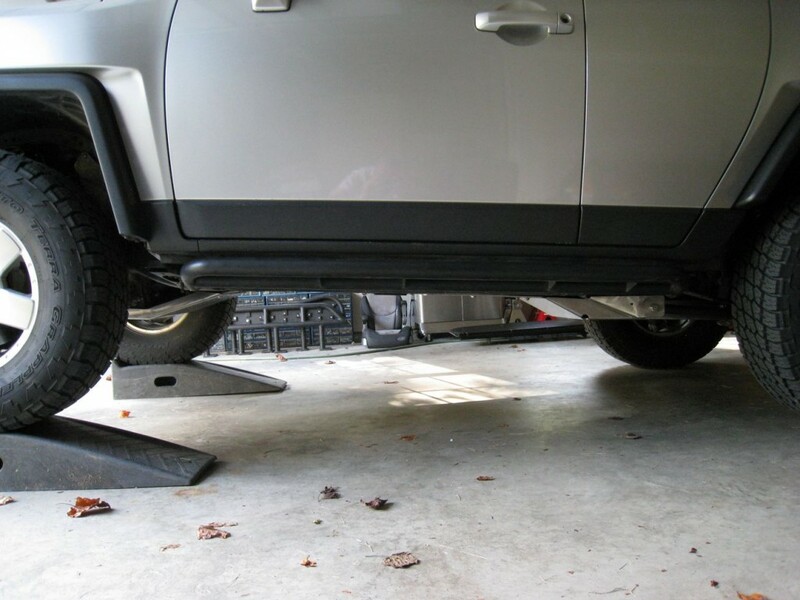 This eliminates the low hanging portion while leaving behind a sturdy mounting point for his custom cross member. 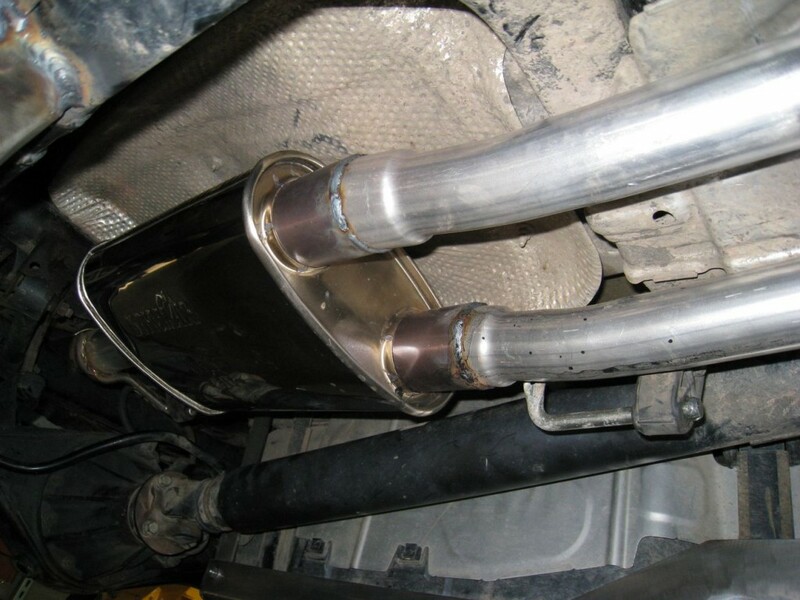 In the next set of photos you’ll notice the driver and passenger side catalytic converters. 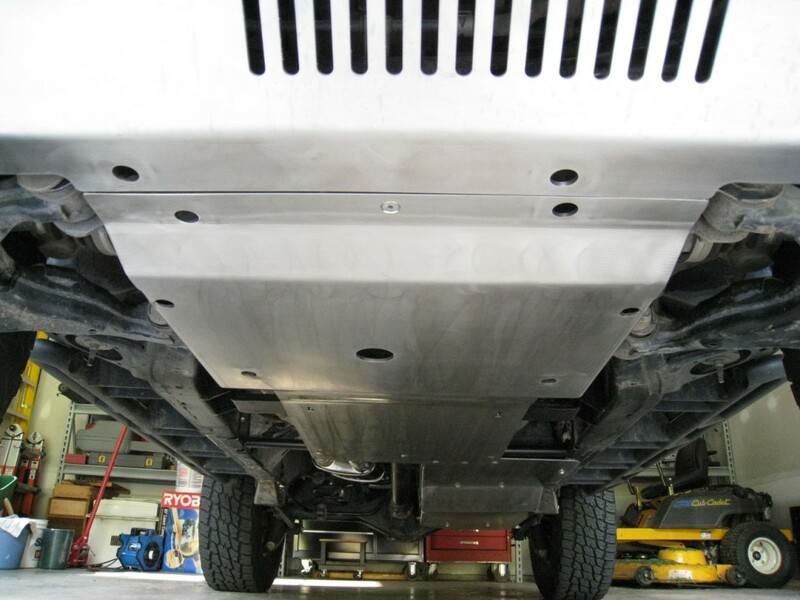 Both converters get chopped and raised during this procedure to allow for additional clearance when the new skids are installed. 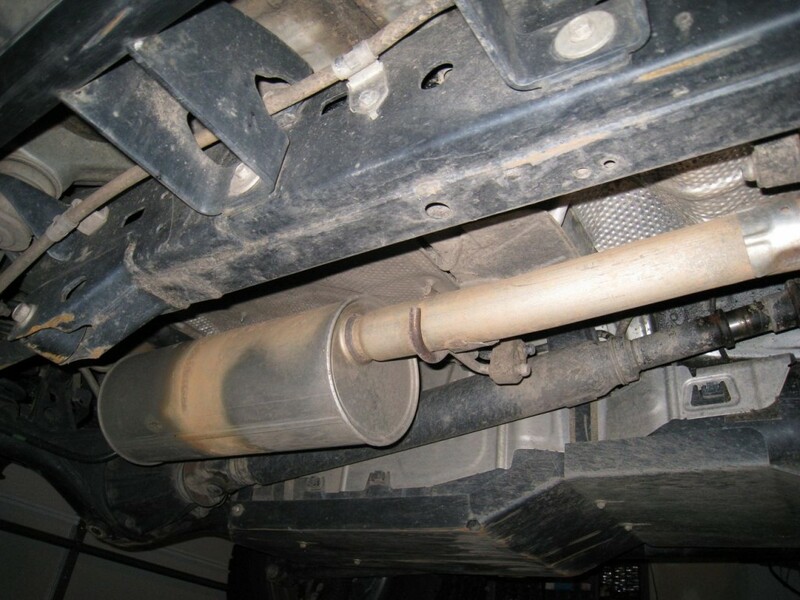 Make note of the rusty stock exhaust pipe. 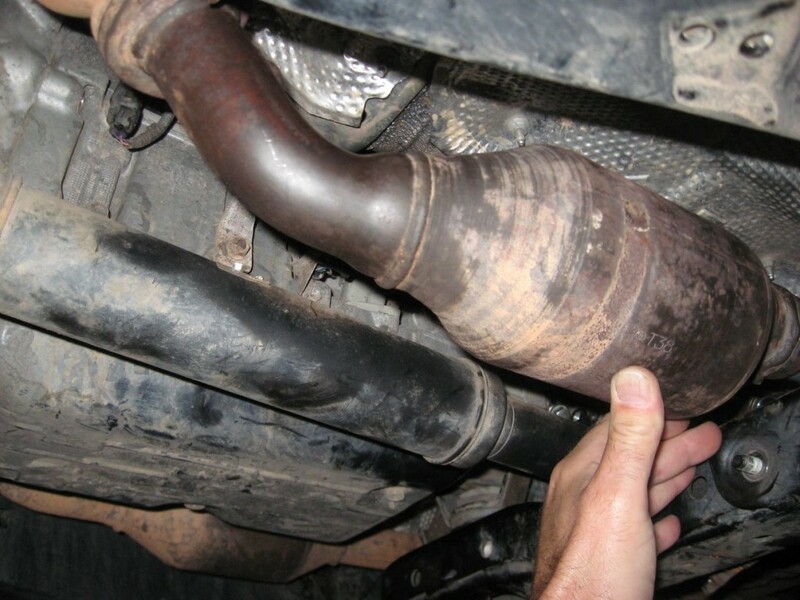 The section from catalytic converters to muffler gets completely replaced. 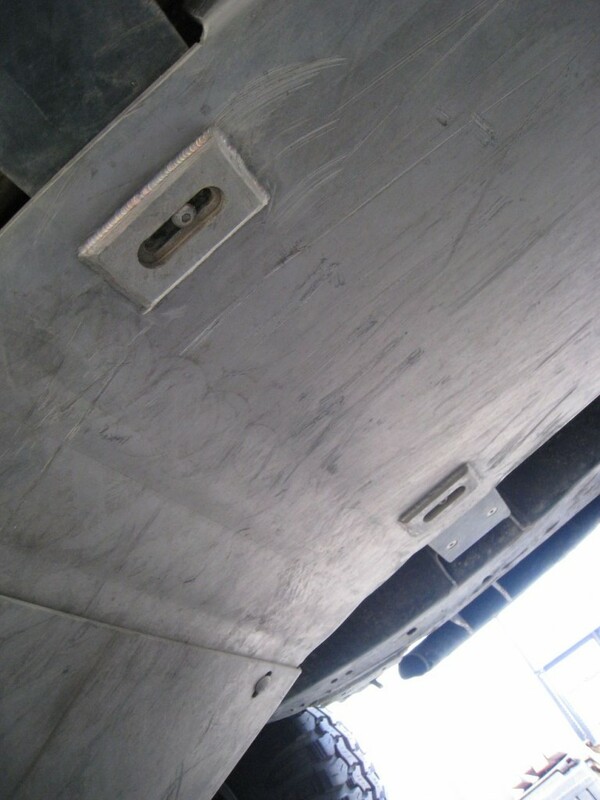 The next pictures show the new cross member and Lefty installed, along with the new exhaust piping that has now been raised as well. 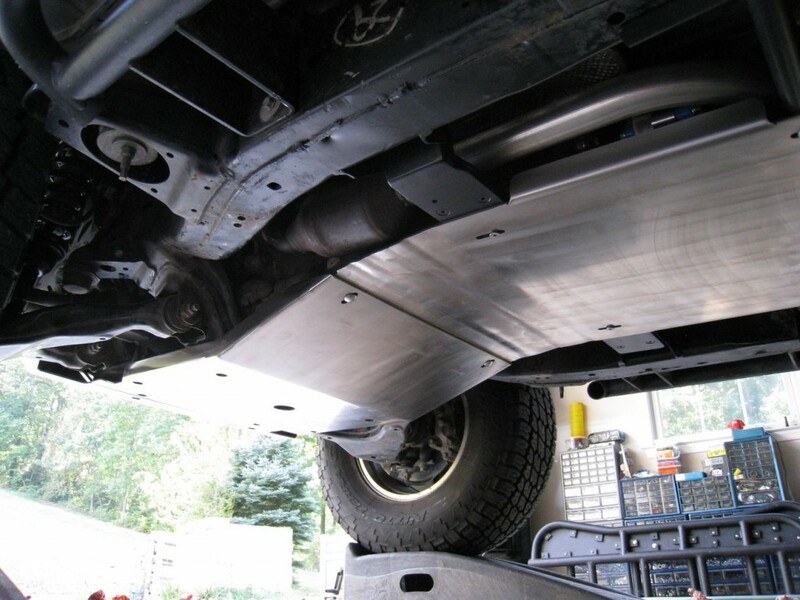 A replacement muffler is not included with the price of the standard tummy tuck but can be added for a little extra. 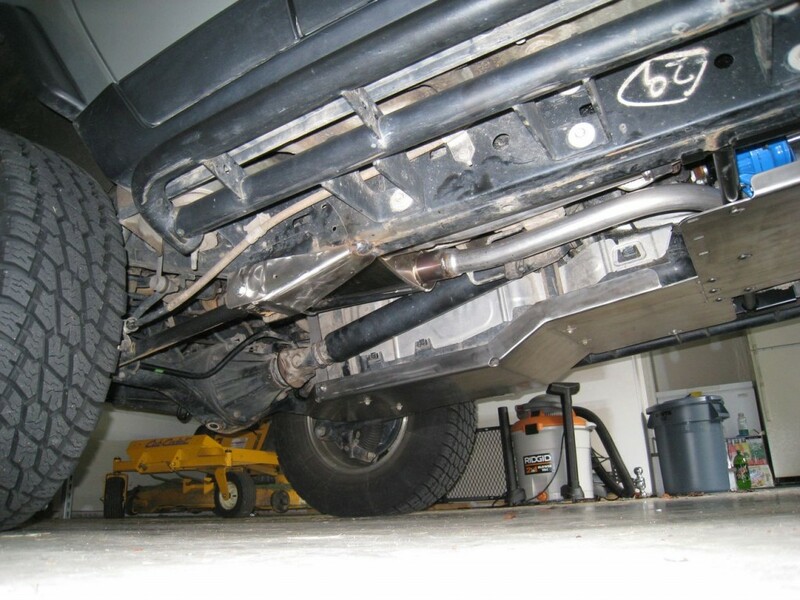 I chose to replace the stock muffler to gain some extra clearance as well as a throatier sound. 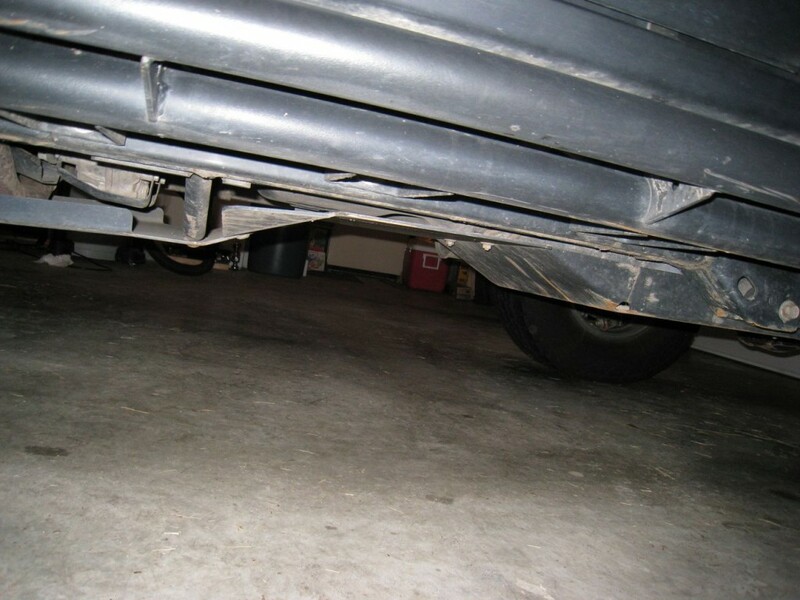 The next photos display the newly formed Budbuilt skids. To help reduce maintenance I opted for stainless steel this go-around. 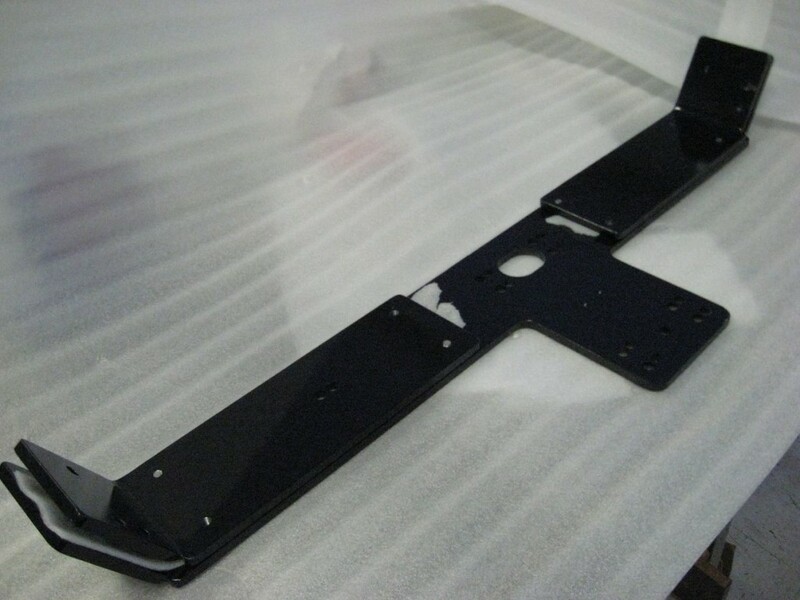 Powder coating is pretty durable for most components. But it doesn’t last long when it’s drug across sharp rocks under the strain of nearly 5000 pounds. 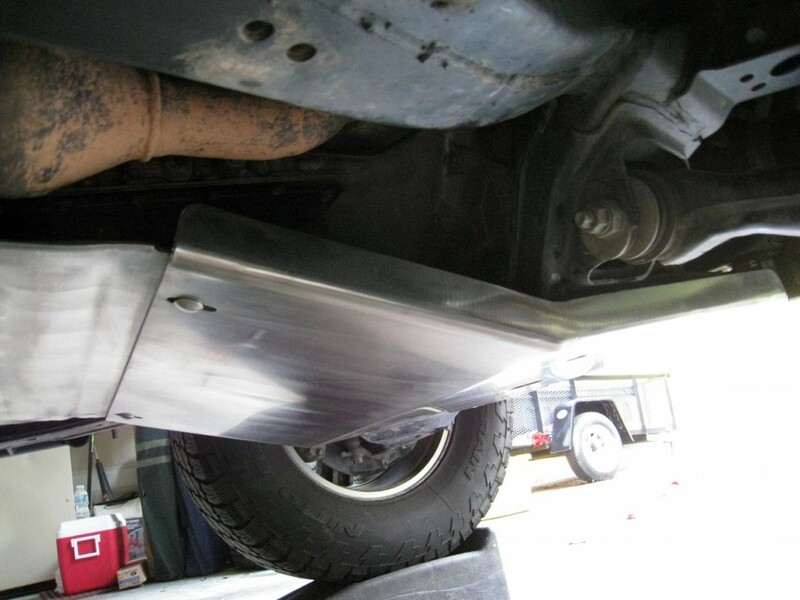 Plus, the stainless skids add a certain show quality to the FJ so it seemed like a win-win scenario. In the second photo below, notice how the skids now raise up at an incline rather than coming straight back from the motor. 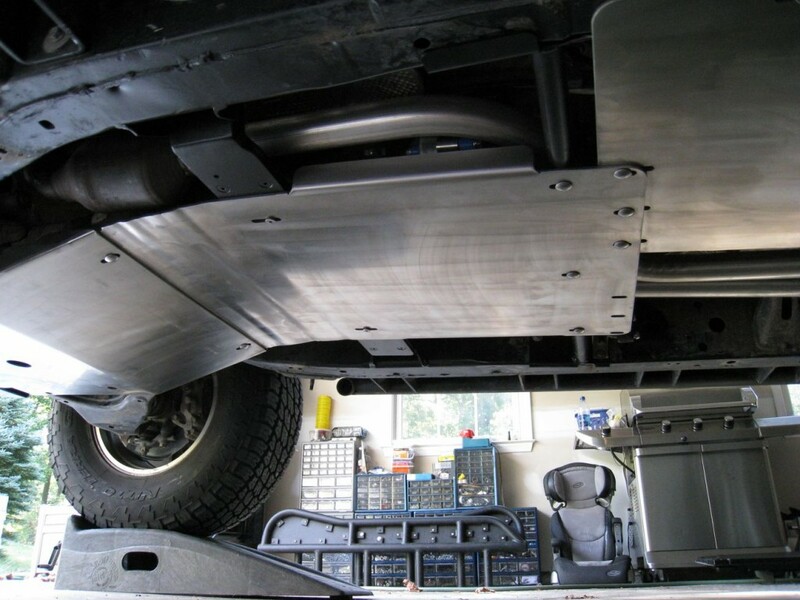 The new high-clearance skids are designed with an upward bend that begins shortly after the engine’s oil pan and rises at an angle to meet the Budbuilt cross member. 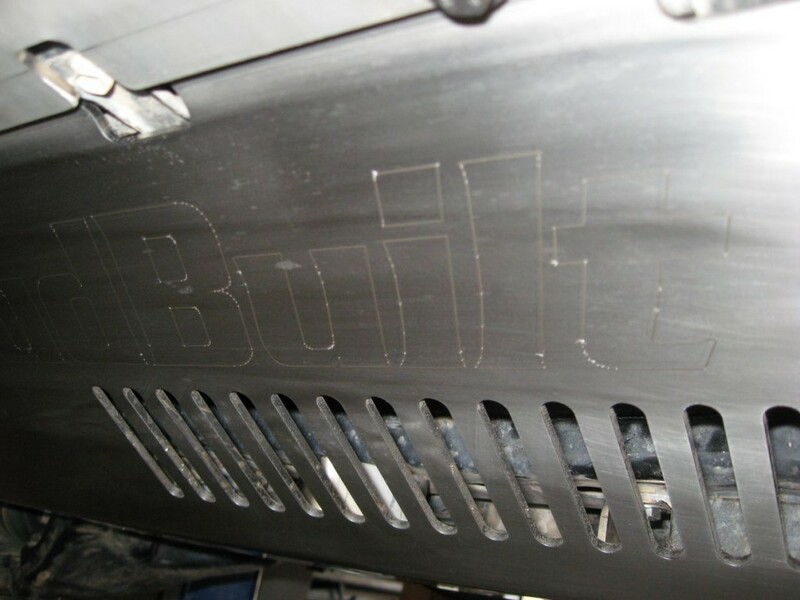 For those who may not be aware, Bud also offers laser cut Budbuilt logos if you’re interested. 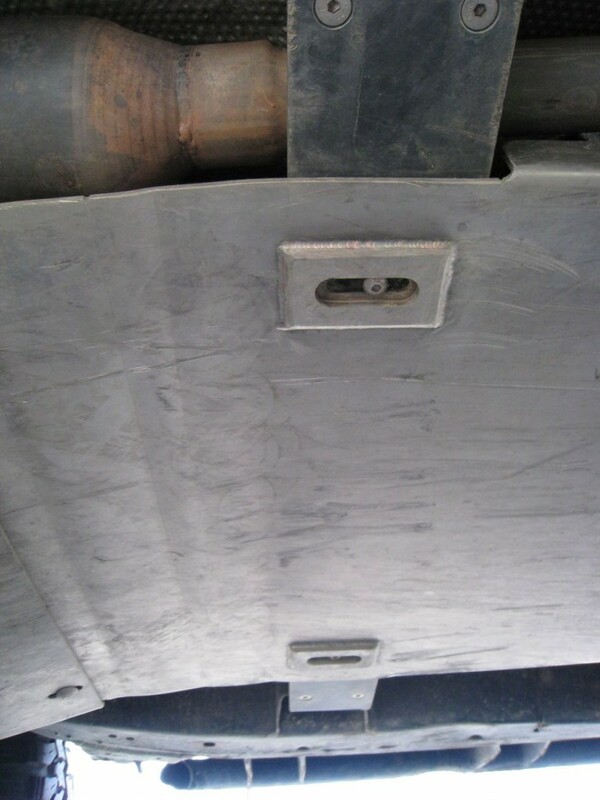 I’ve included a few shots of the front skids with logos below. Below are some shots taken during the prototyping phase. 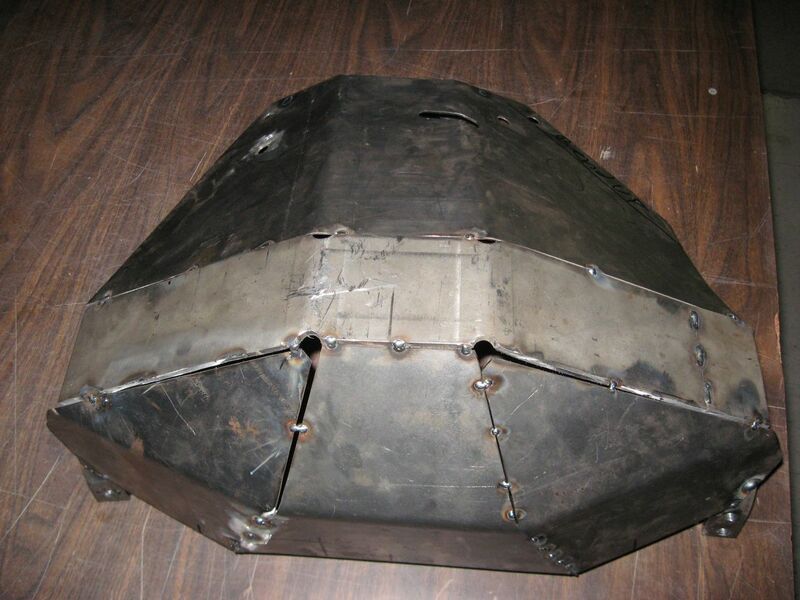 Please keep in mind that the materials using during prototyping are intentionally of a much lower grade and thickness and tack welding is used to hold individual portions together. This helps to save time and money during testing because it’s cheaper to produce prototypes and much easier to modify in this form. 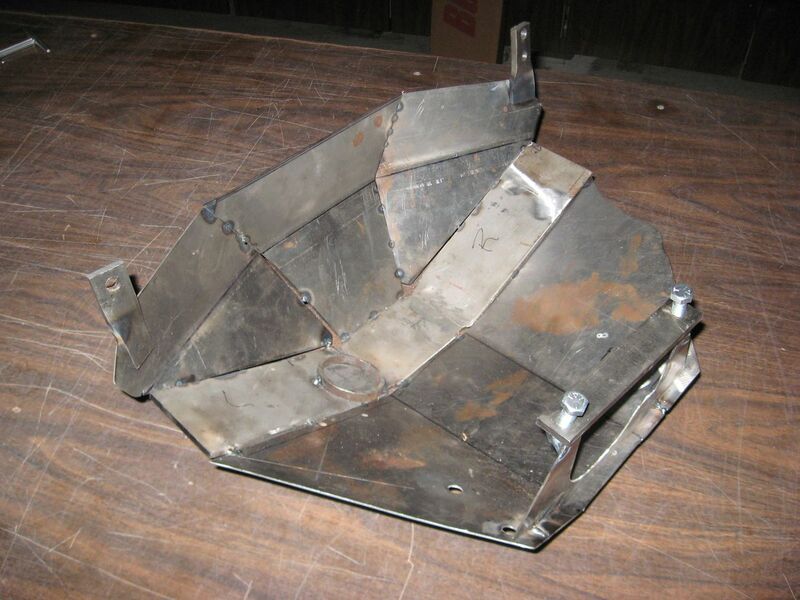 Once these products reach the manufacturing stage, they are laser cut using a CAD design and full grade material, and all seams are fully welded, ground and polished. As you’ll note from the later pictures, Bud’s engineering and manufacturing background play a big part in creating products that are extremely precise in their design. 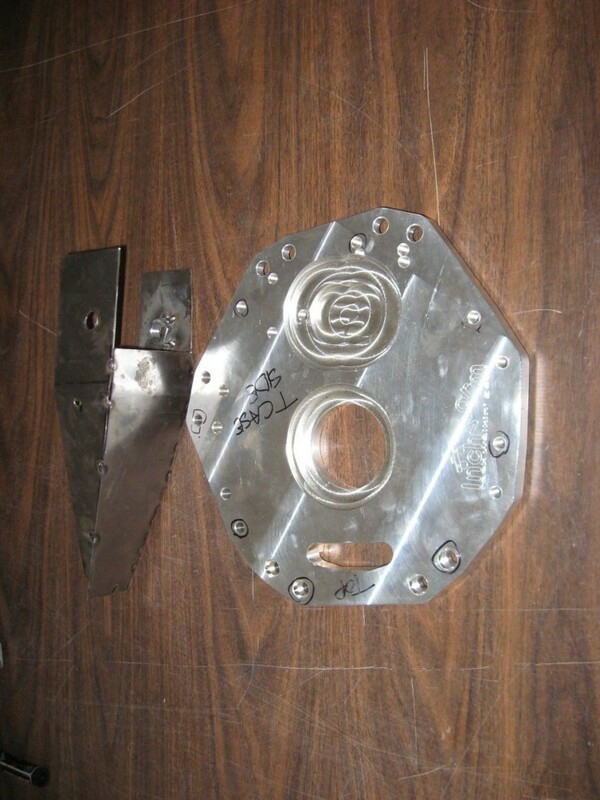 Below are the prototyping pictures taken while Bud was designing the rear differential skid plate. The final result was truly a work of art. I’ve given him more than one compliment on this masterpiece and based on customer reviews I’d say others wholeheartedly agree. 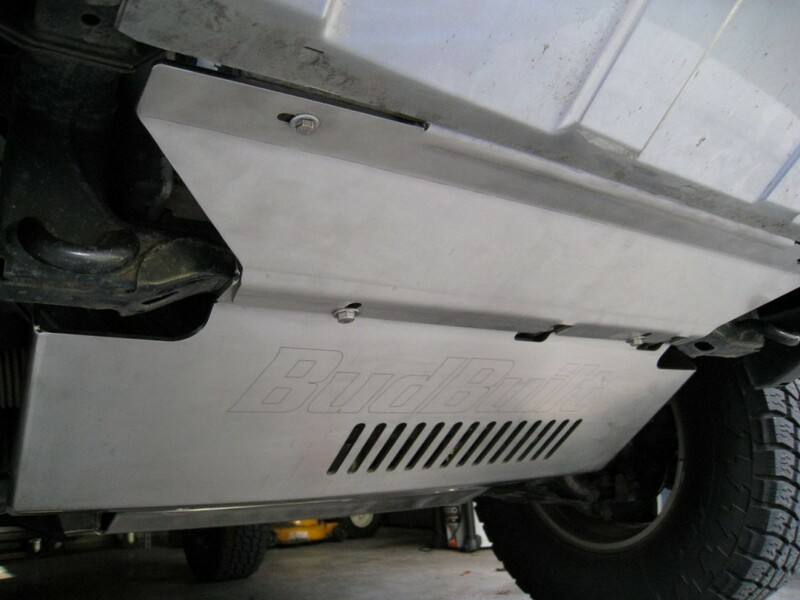 Thanks to Bud’s efforts, the FJ Cruiser community now has one more piece of Budbuilt equipment to drool over. 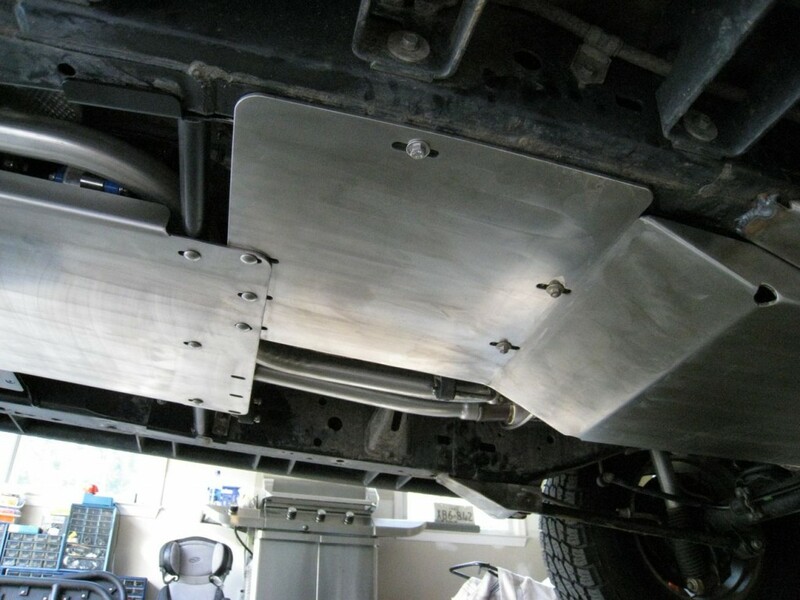 In addition to the skid plate, Bud had been wanting to develop a clocking plate that could be used to rotate the stock transfer case upwards for those looking to gain some additional clearance without investing in an Inchworm Lefty transfer case. 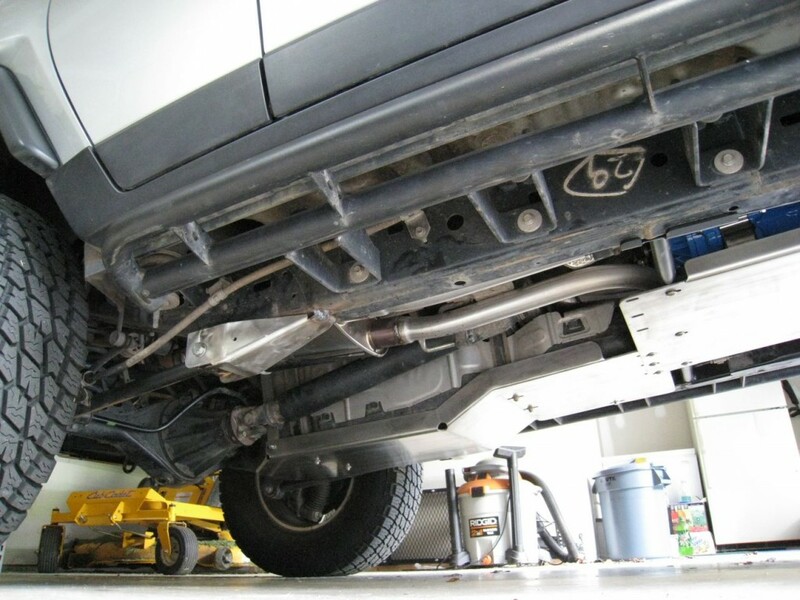 I believe this is considered a partial tummy tuck since it still utilizes the custom Budbuilt cross member but it allows FJ Cruiser enthusiasts to do this upgrade in stages instead of all at once. And while it doesn’t gain you the 4″ that the Lefty does, it still provides close to two additional inches of clearance which is still an advantage over the stock configuration. 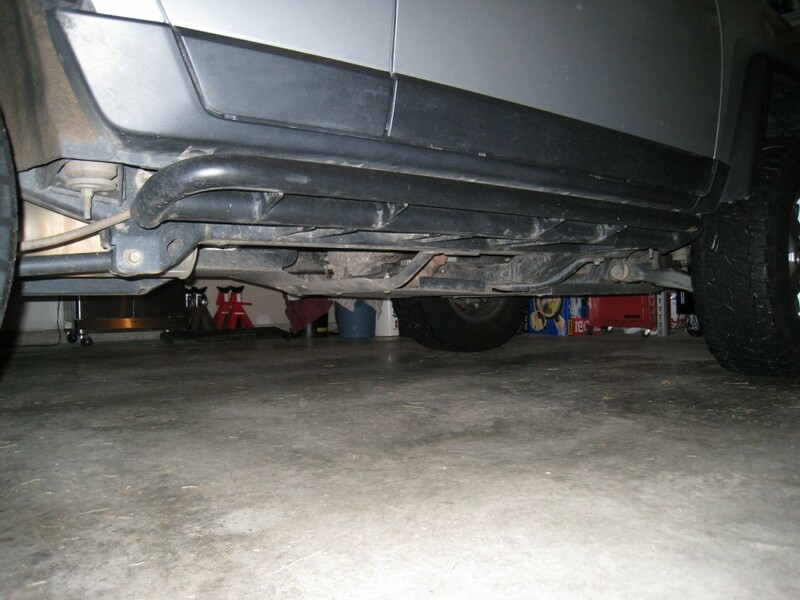 One of the items that I personally requested from Bud was a set of skids for the front portion of the rear lower control arms since this is a known weak area in the stock design. Bud happily obliged me and came up with a design that is both versatile and quite sturdy. 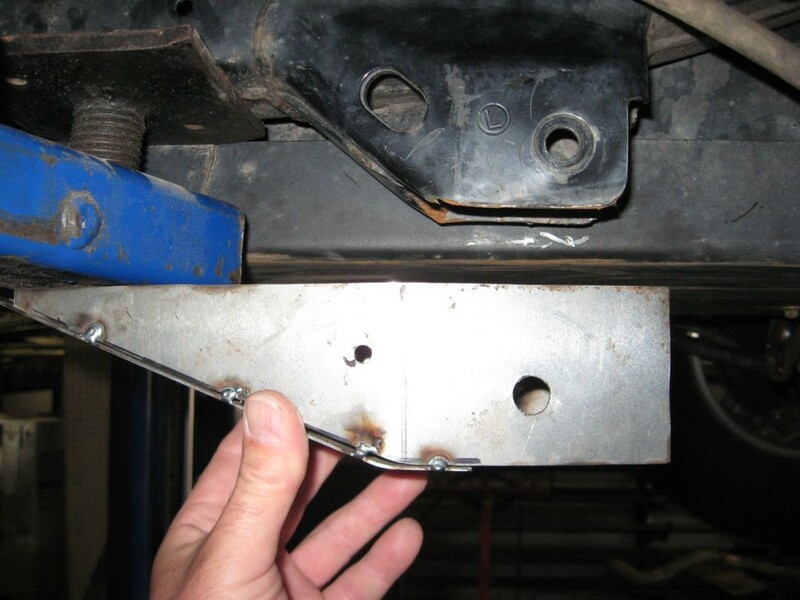 Unlike some of the other aftermarket link skids, Bud designed his to be slightly wider than the stock brackets. 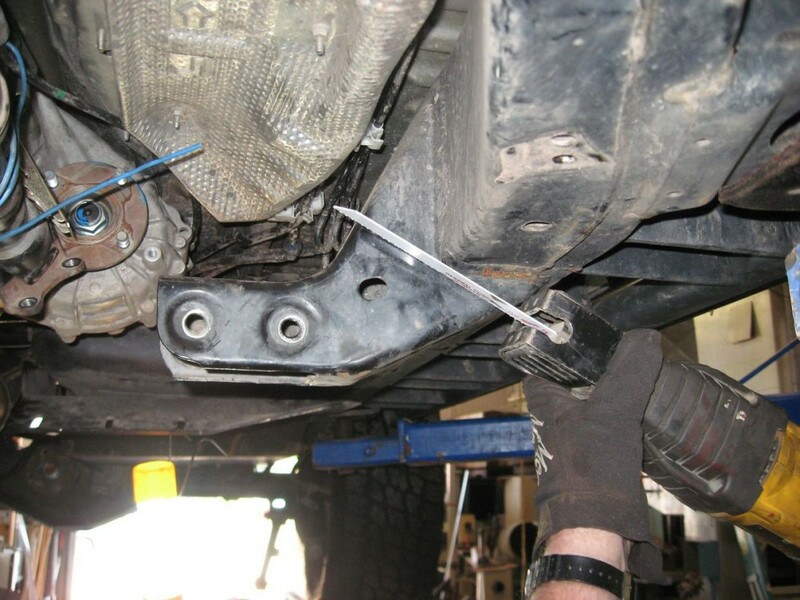 This works much better for those folks who may have bent or damaged the stock bracket. 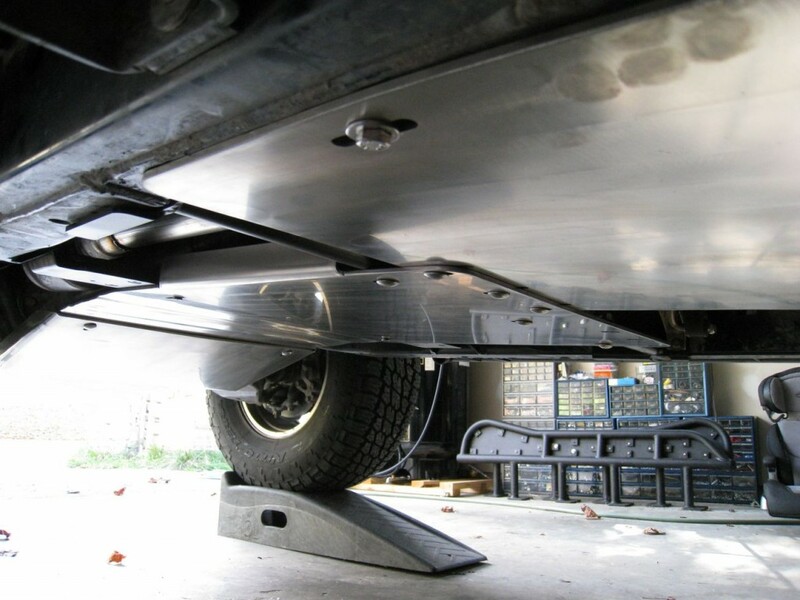 It also provides a wider surface area which distributes the weight more evenly when encountering an obstacle. 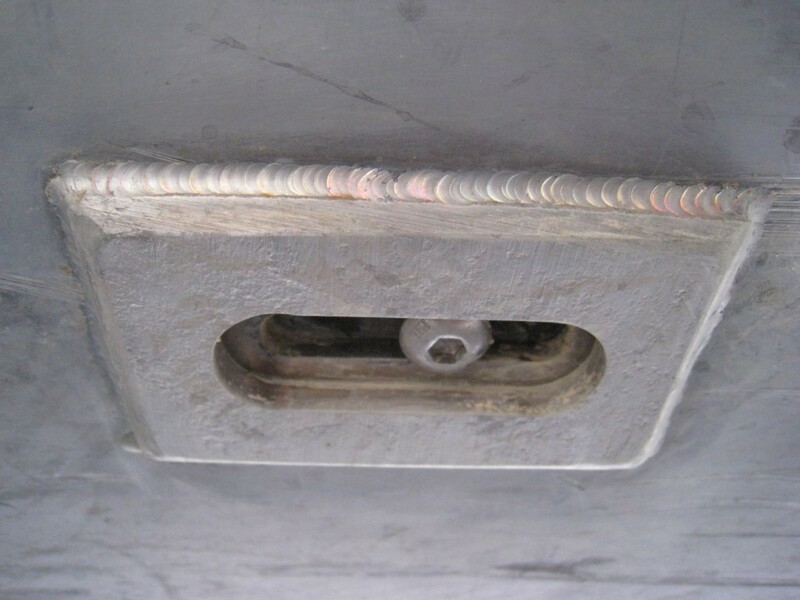 The stock mounting bolt is replaced with a heavier grade bolt and shims are used to fill the remaining interior space. 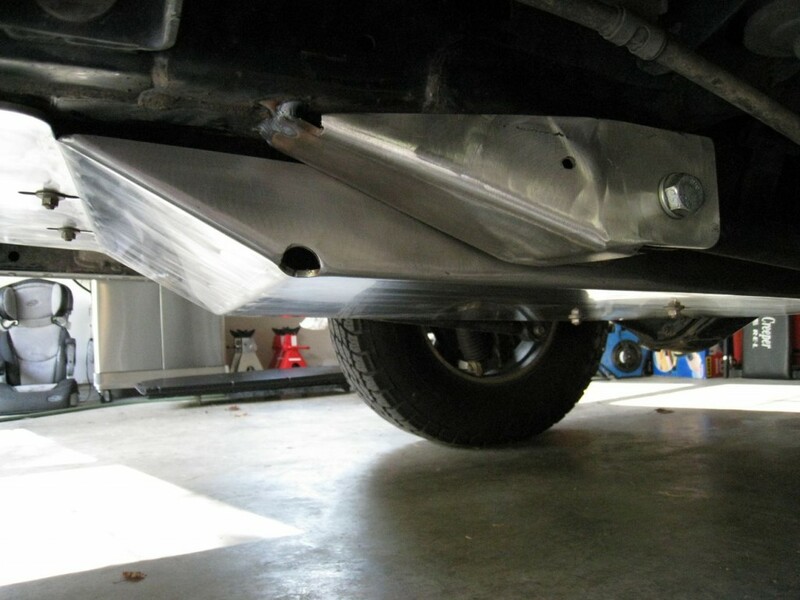 Like most Budbuilt products, these skids are intended to be a bolt-on part but they can also be welded for extra strength. I’ve included a few of the post-installation photos to give a better idea of the final result. 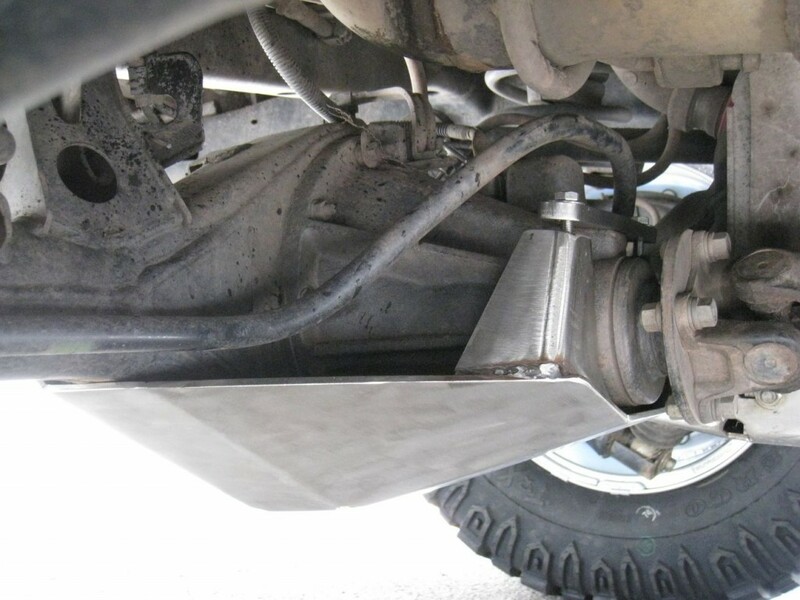 Like the rear diff skid, Bud now offers the lower link skids as part of his standard product line. 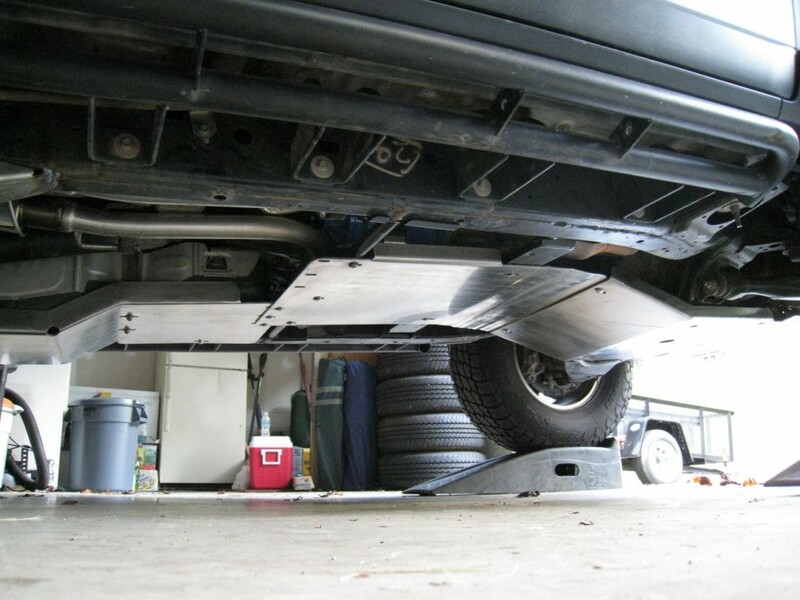 As though the standard Budbuilt skid plate package wasn’t enough, Bud took this opportunity to add yet another item to his arsenal – a forward-facing skid that fills the gap between the front-most cross member and the bottom of the front bumper. 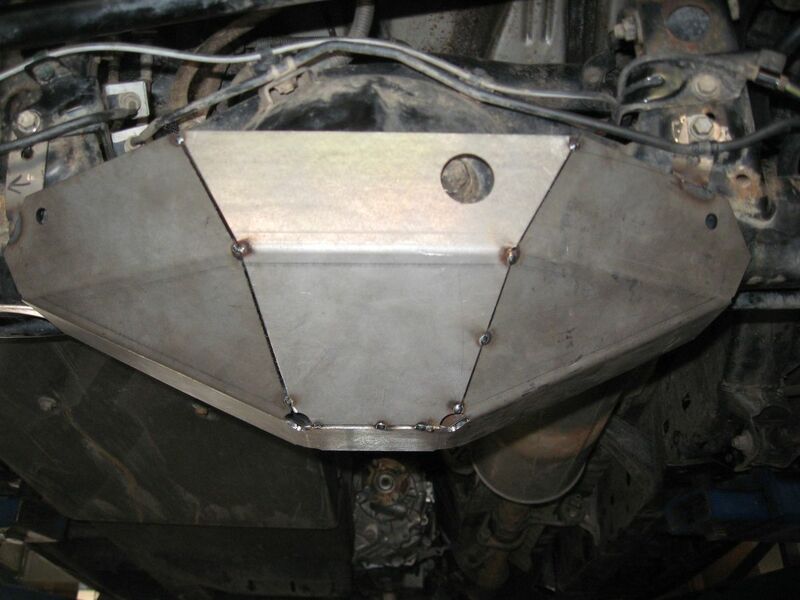 Like Budbuilt’s other skid offerings, this newly-designed skid is laser cut from 3/16″ material and offers vital protection for the primary radiator and any other coolers you may have installed. 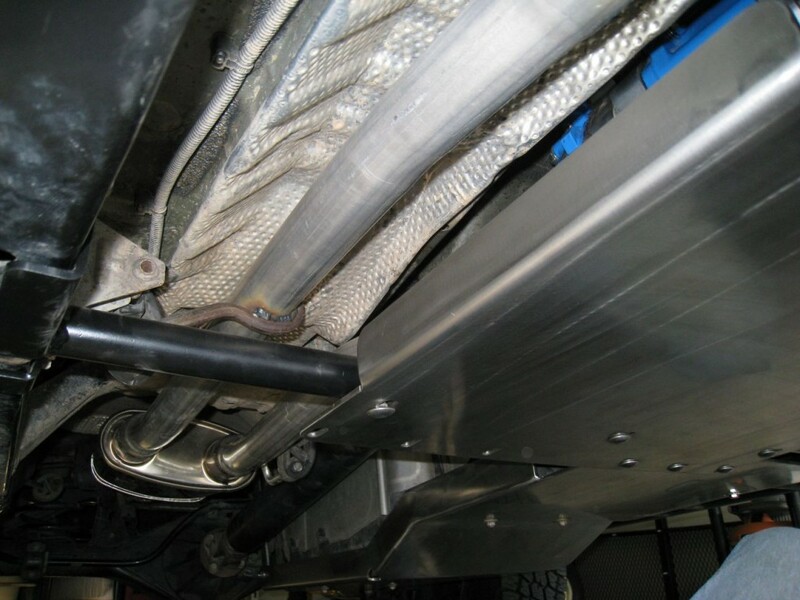 In my case, this space also contains a transmission cooler, as well as the motor and hoses for the supercharger intercooler. 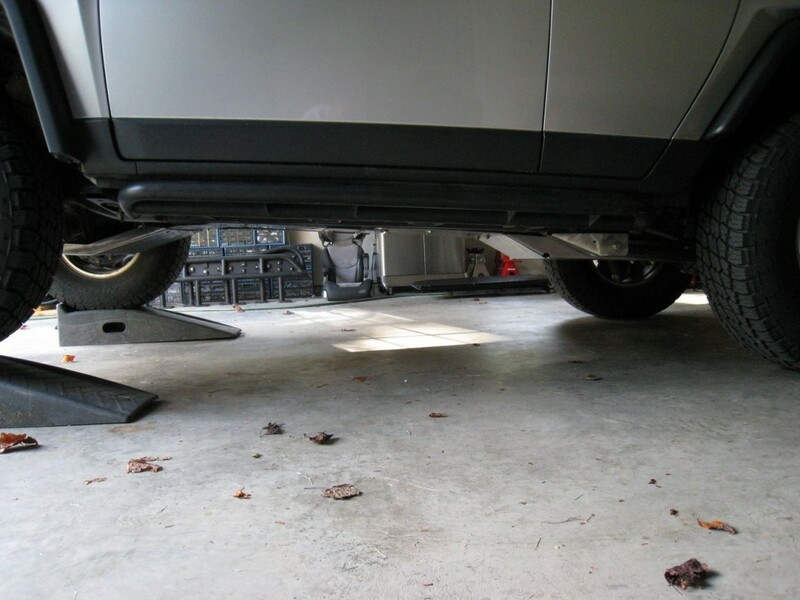 Now, thanks to this new skid, I no longer have to worry about branches or flying rocks damaging my vital cooling components and leaving me stranded due to leaks or overheating. I don’t actually have any of the prototype pictures for this particular skid so I’ve just included some photos from post-installation instead. Well that pretty much covers the prototypes that I can share at this point. There is no doubt that Bud deserves a tremendous amount of credit for completing such a large number of tasks in such a short period of time. 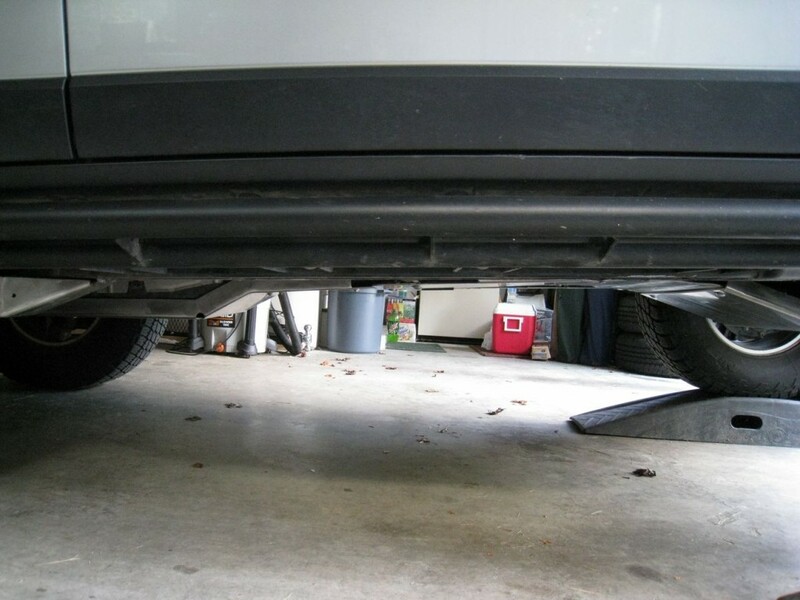 Not only was the tummy tuck done in record time, but the FJ community now has several new items to add to their Christmas wish list as a result of his efforts. 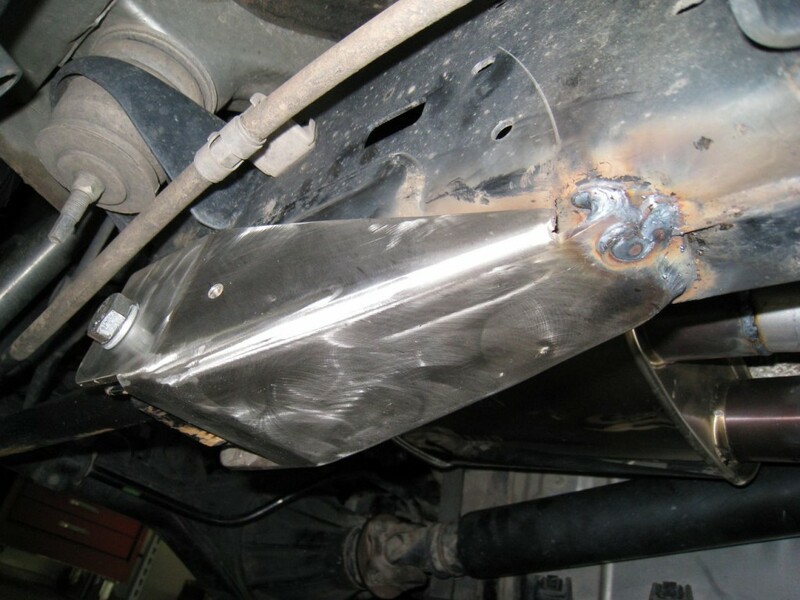 As a testament to the lengths that Bud will go to please a customer, Bud apparently went through eight different brands of mufflers until he finally came across one that offered both the clearance and the sound he thought I was looking for. Now that’s commitment to customer service! As impressed as I was with the photos, I was even more impressed when I arrived back in his shop several weeks later. The final product was absolutely stunning! 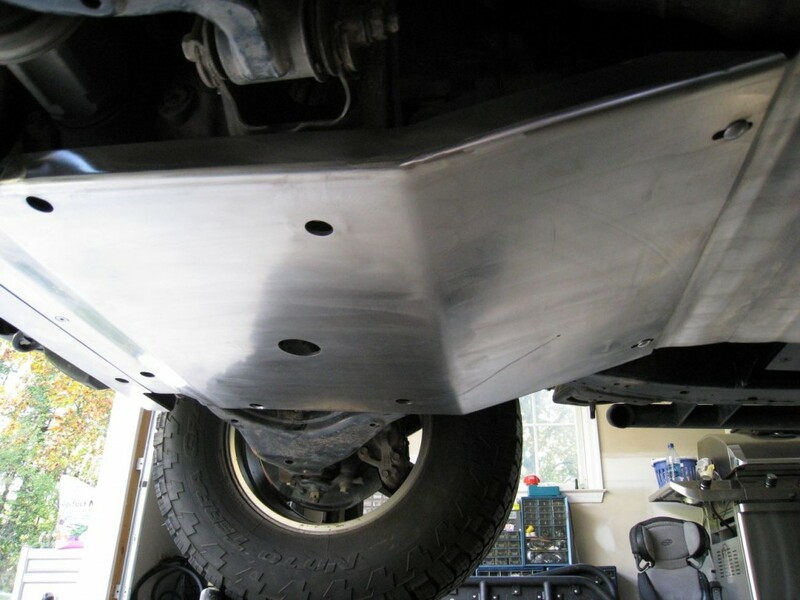 The new skids not only offered a lot more clearance, but Bud had taken the time to polish up the stainless steel surface to the point where you could almost see yourself in the reflection. Not to be outdone by its shiny protectors, the new Inchworm Lefty stood apart from the rest of the stock components, visibly broadcasting its presence with Inchworm’s signature powder-blue case and thick aluminum clocking plate. 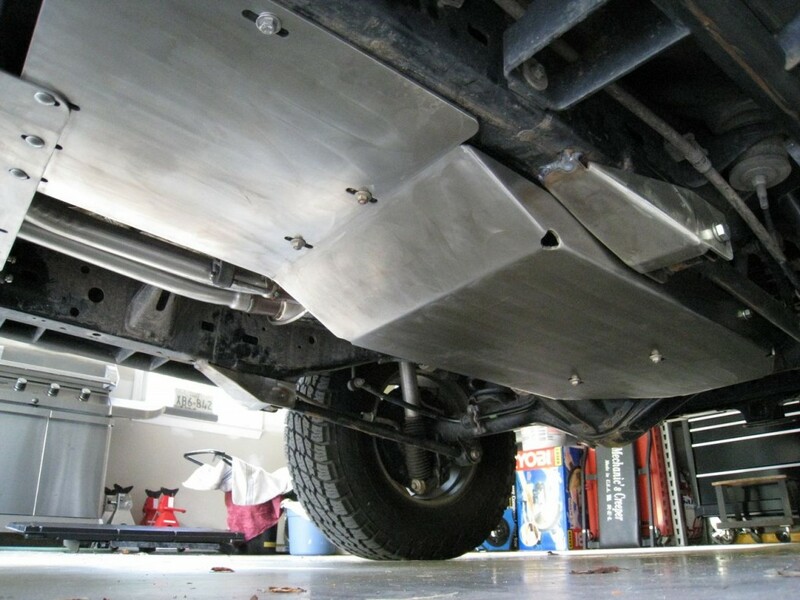 The new beefy cross member sat slightly higher than the bottom of the frame rails, providing a solid mounting plate for the transmission above and the new skids below. I think I probably spent over an hour just talking with Bud while he went over all the modifications in detail. 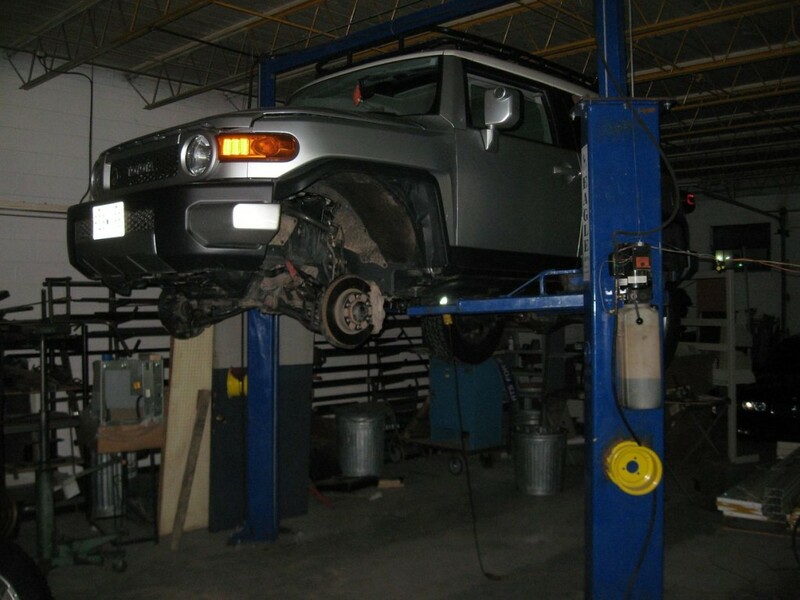 More than a year has passed since I visited Bud’s shop and there’s still no doubt – the Budbuilt tummy tuck remains my favorite FJ modification to date. The lower gear ratio is absolutely awesome for hill descents, providing superb control when I need it the most. It works quite well in rocky terrain too, allowing me to crawl through some very rough areas without having to constantly ride the brakes. The overall experience did come with a few lessons, however, which I’d like to share. I’d like to clarify that I’m sharing these experiences with the intention of helping others who decide to pursue some or all of the above modifications. 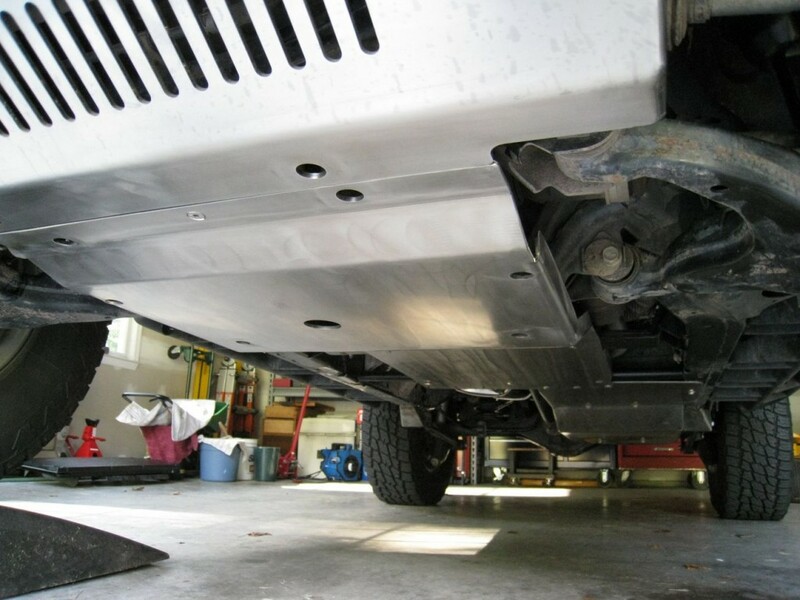 My FJ was officially the second FJ to undergo a Budbuilt tummy tuck procedure so in terms of practice and implementation Bud had a lot of new ground to cover and he did an amazing job at that. I know we’ve both learned a great deal as a result and I sincerely hope that relating these issues can help someone else out there who may run into similar problems. 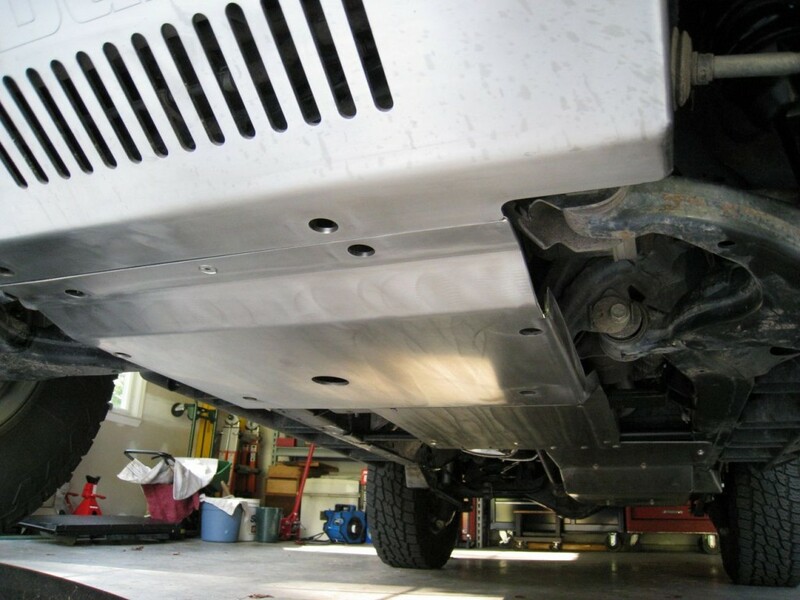 Perhaps one of the most notable, yet unexpected, issues to arise after the modifications was due to a clearance issue with the Lefty transfer case. 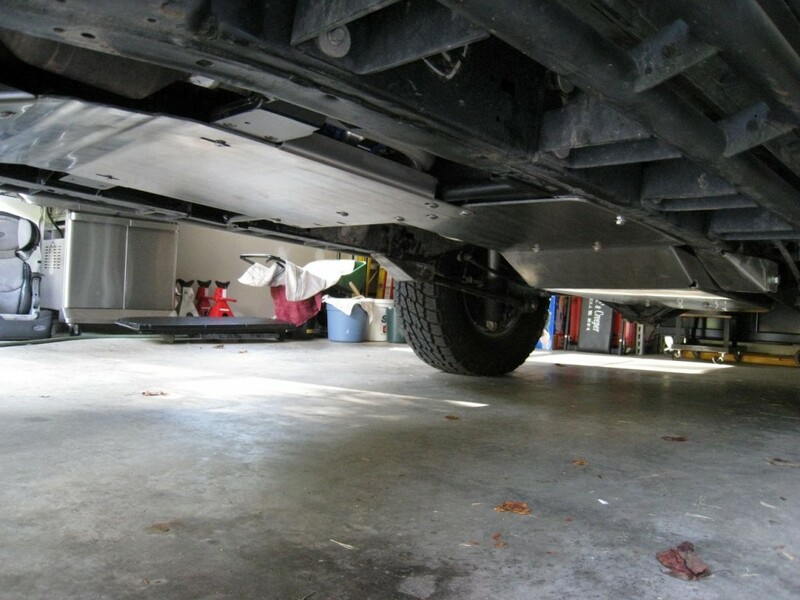 In an effort to gain as much clearance as possible, Bud raised the Lefty and transmission cross member up slightly higher than on the previous install. 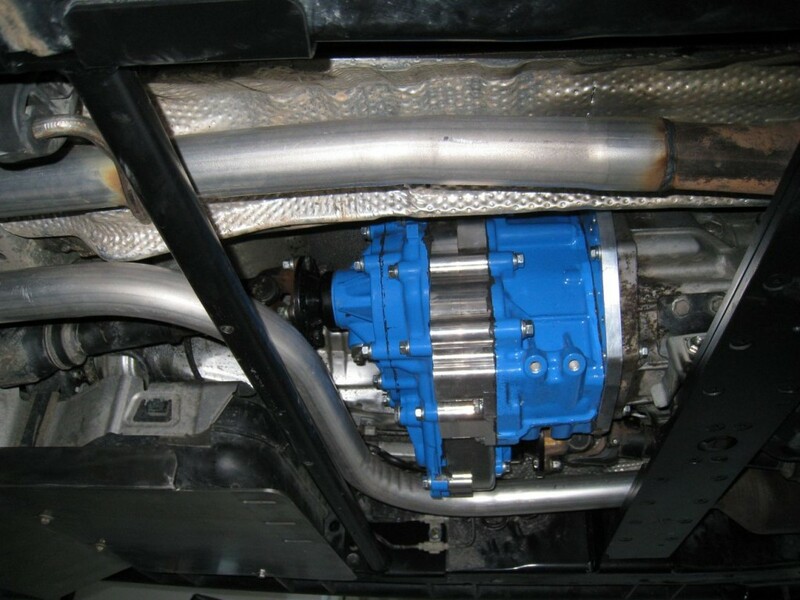 This would not have posed a problem had it not been for the added torque of the supercharger. 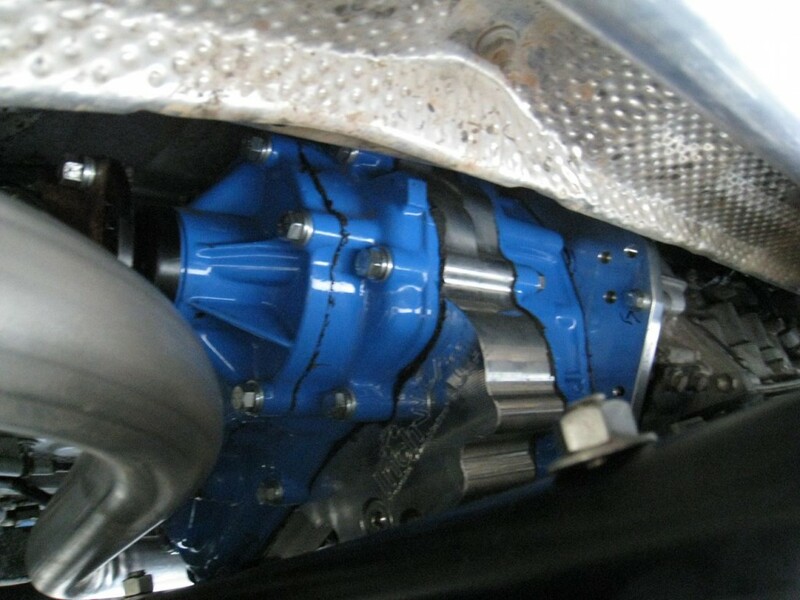 Short take-offs and other high-torque scenarios (primarily in first gear) caused the Lefty to spin in a clockwise motion, striking the underside of the transmission tunnel in the process. It wasn’t enough impact that it was going to damage any of the components, but the repetitive clunking definitely got your attention. To save me a return trip to NC, Bud arranged to have me meet with Cal at Iron Pig Off-Road in Virginia, in hopes of making some minor adjustments that would resolve the issue. 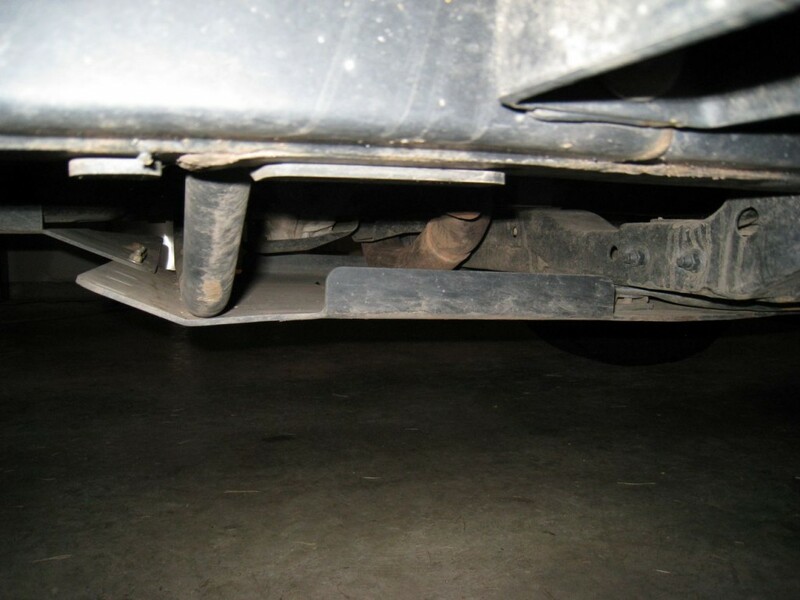 After several hours of trial and error, IPOR discovered that relocating the mounting holes in the cross member about 1/2″ towards the passenger side resolved about 90 percent of the clearance issue. But there was still light contact under high torque. 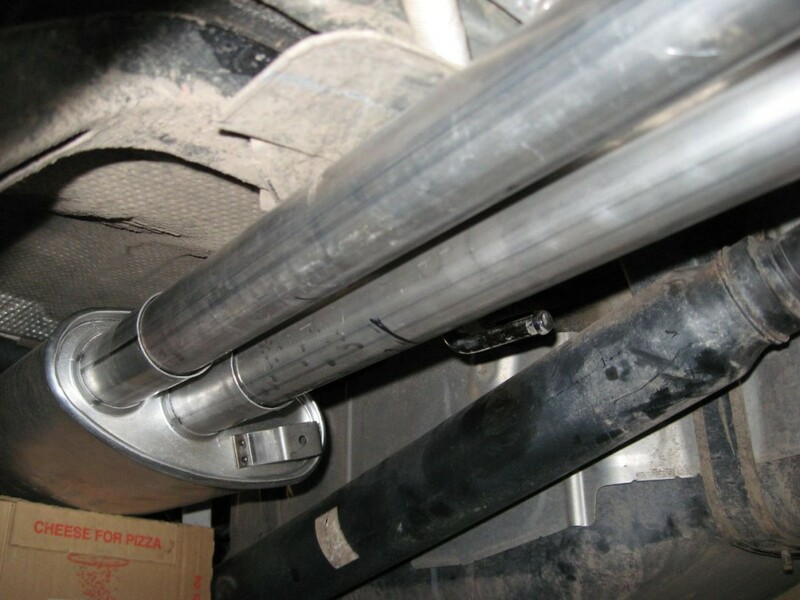 When I relayed this information to Bud he immediately set to reworking the cross member design to account for more torque and greater clearance. 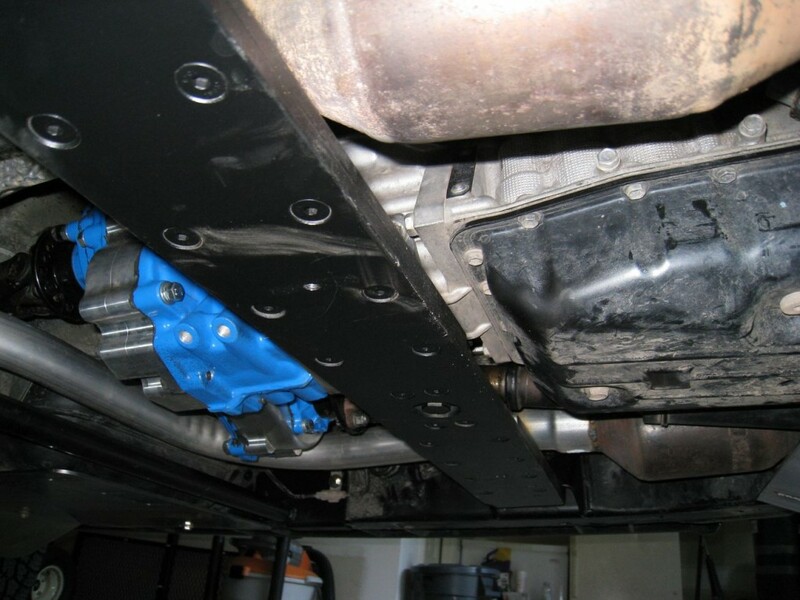 The new design offered two separate mounting locations as well as an additional rearward section that would bolt up to the bottom of the Lefty transfer case for added support during high torque. 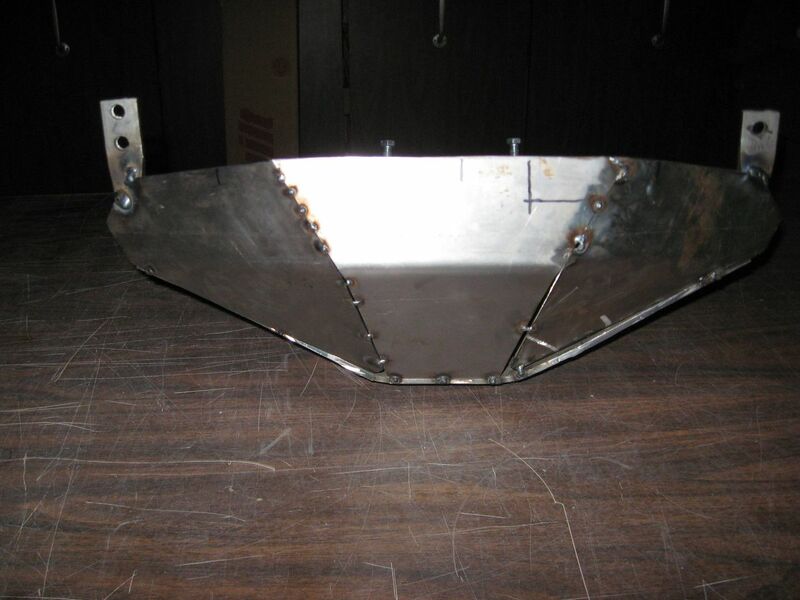 The plan was to get the new design finalized and manufacture a prototype which he would then send to me for testing. While I waited for the new cross member to be completed, another minor issue cropped up. 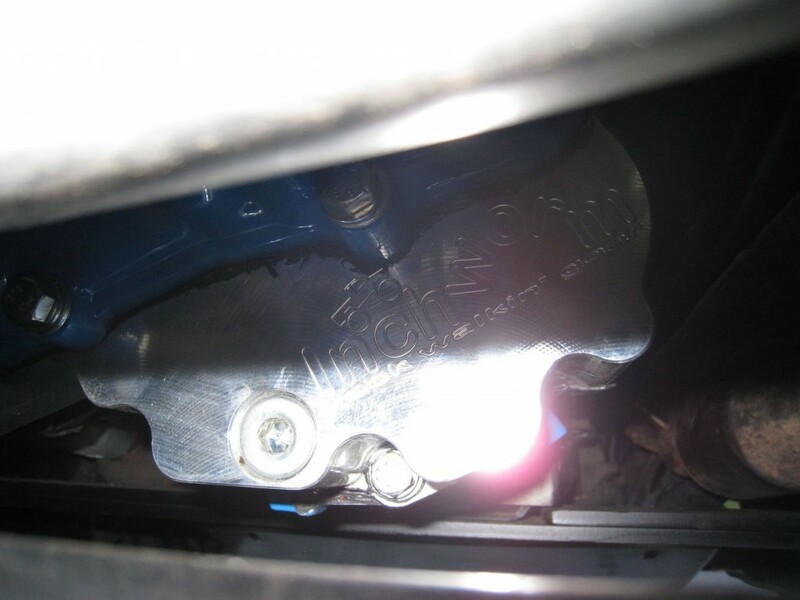 To properly tighten the bolts in the front of the lower links, several shims were required to fill the space within. At some point over the month that followed my NC visit, these shims started to rub against one another, resulting in a very audible creaking. 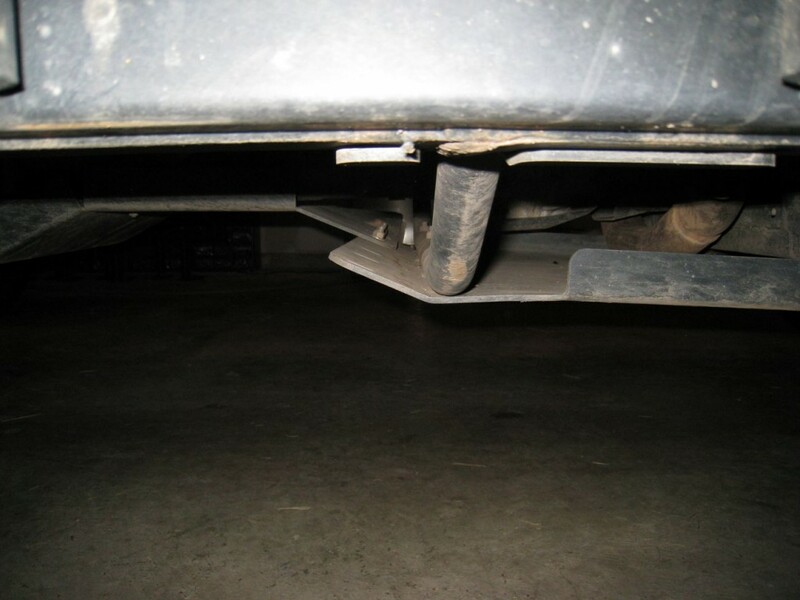 Again, this was a minor inconvenience that in no way affected the mechanical or structural integrity of the vehicle. But like most rattles, creaks and groans, it tended to be very distracting while driving. Shortly after the first snow in Maryland, I discovered another bug in the system. 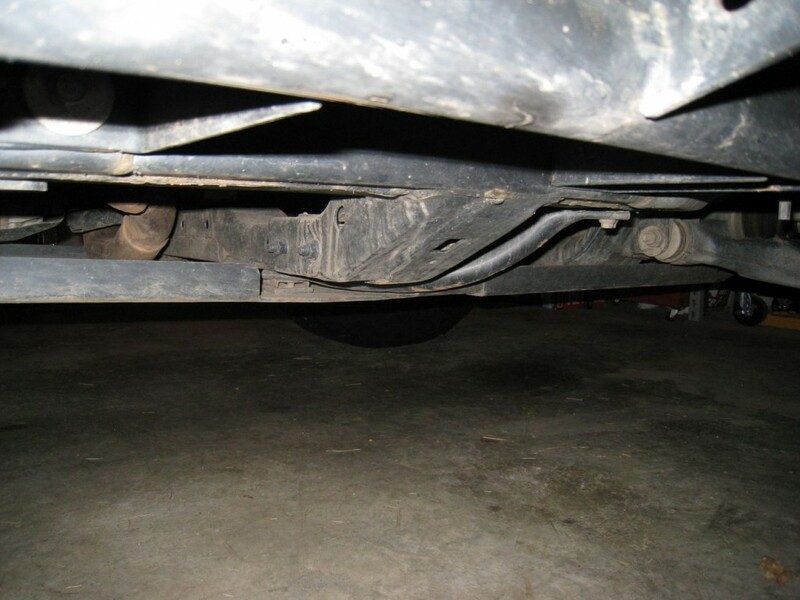 The stock transfer case has three separate sensors. 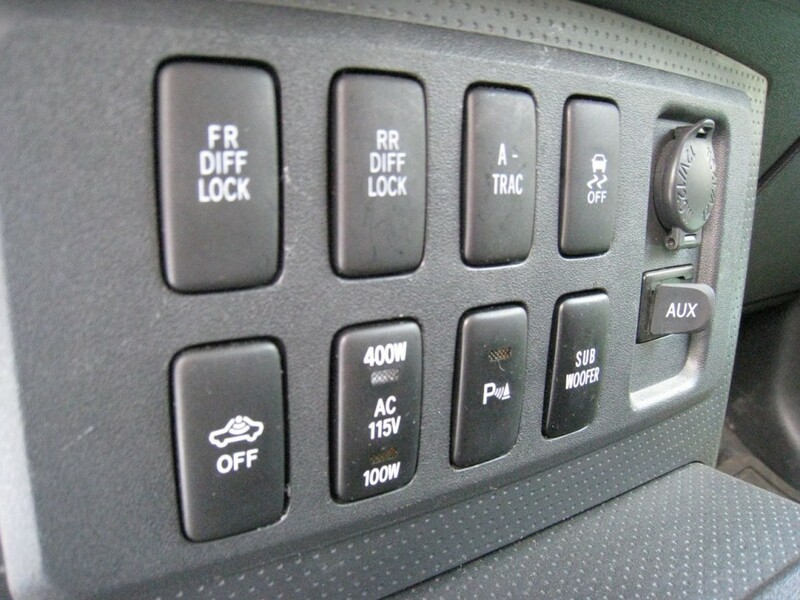 The first one detects 4-wheel drive high and low range, the second one is used to engage the automatic differential disconnect (ADD), and the last one detects if the vehicle is in neutral. Of these three, only the first one is used on the Lefty. 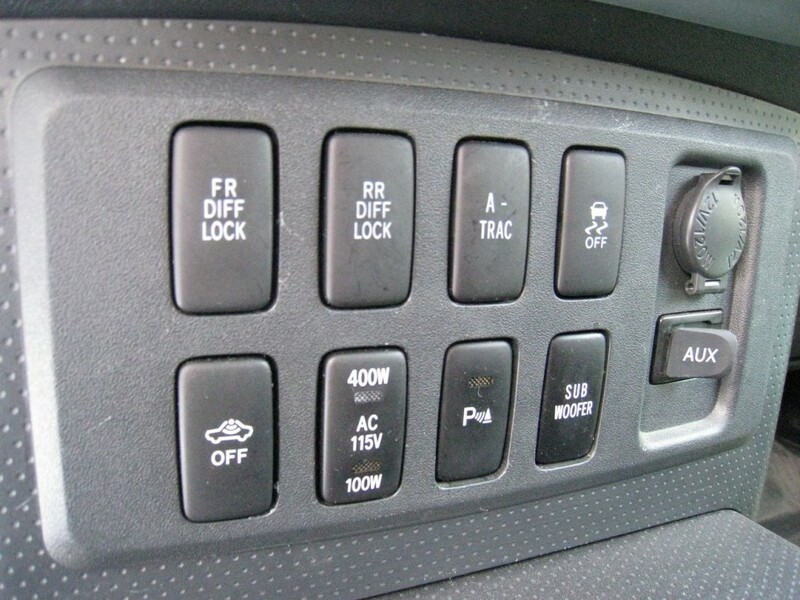 A separate optional switch is generally used to engage or disengage the ADD (if you want shift on the fly), and the neutral indicator is no longer used once the stock transfer case is removed. The problem I experienced was that any time I exceeded ~25mph in 4-wheel drive high range, the dash would light up the following indicator lights: Check Engine, TRAC, VSC-OFF, VSC-TRAC. When I pulled the error code it showed up as “4WD LOW CIRCUIT”. Despite the codes being thrown, however, there didn’t appear to be any real mechanical issues. Since none of the above issues really posed a problem per se, I decided to focus on all the positive benefits of the tummy tuck instead of a few minor setbacks. 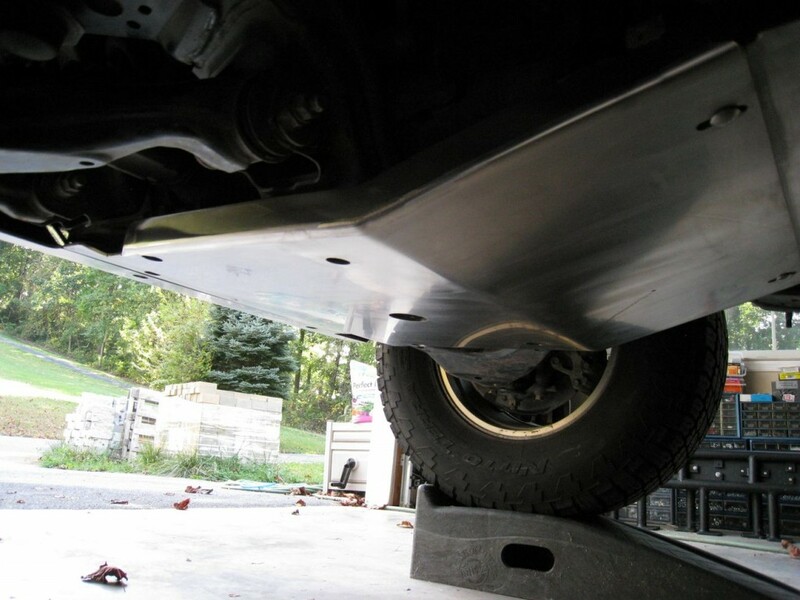 Unfortunately my attention was diverted shortly thereafter, when the rear output seal of the Lefty started bleeding gear oil, which put me in a bit of a panic. 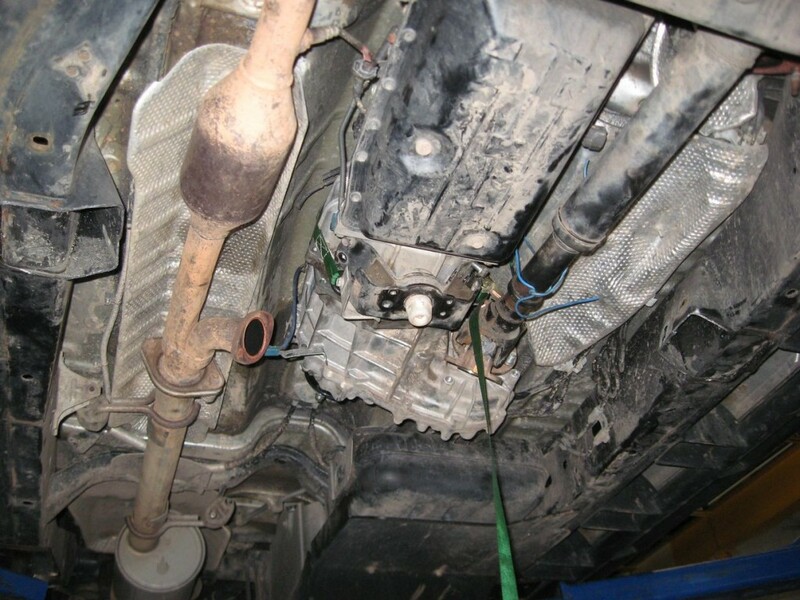 I tried contacting local mechanics to investigate and repair but everyone locally was booked up for two to four weeks. I finally contacted Bud and explained the full scenario. As another testament to just how far Bud will go to please his customers, he dropped everything he was doing and arranged to meet me in Virginia the next day in order to save us from driving the FJ all the way down to North Carolina. 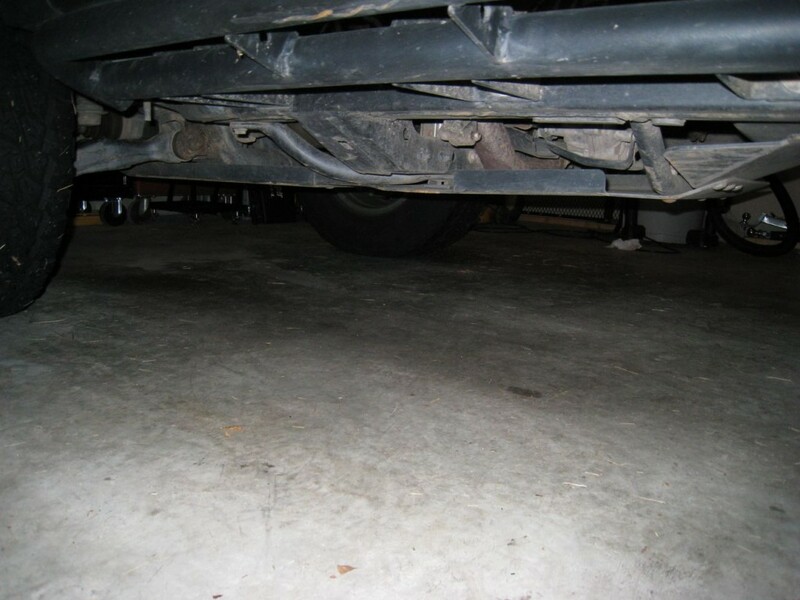 He even offered to help with the cost of a rental vehicle in the event that repairs took longer than anticipated. 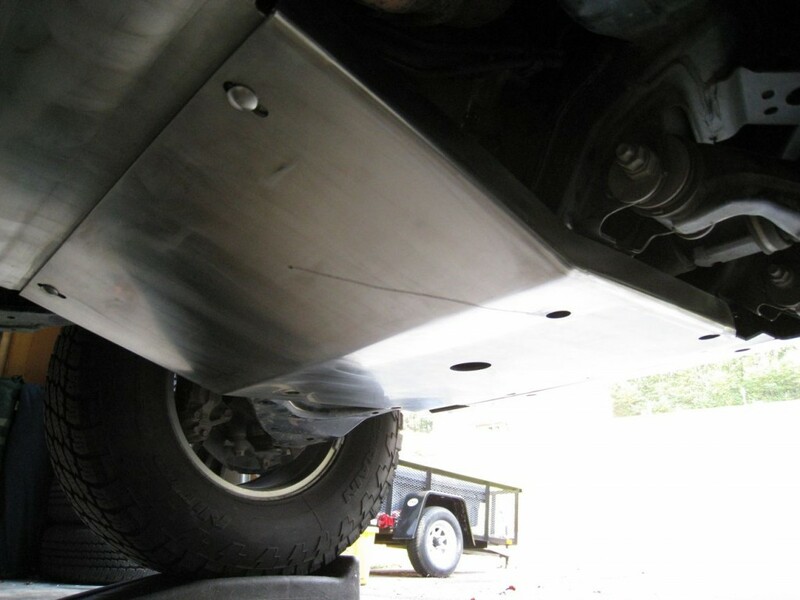 With the FJ back in his shop, Bud replaced the standard Inchworm output seal with a new seal from Marlin Crawler that has a much better reputation for reliability and durability. Since this seal was replaced, I have had no further leaks. He also spent a great deal of time troubleshooting and fixing the other issues related to clearance. The new cross member was now ready for testing so he replaced the original style with the newly updated model. 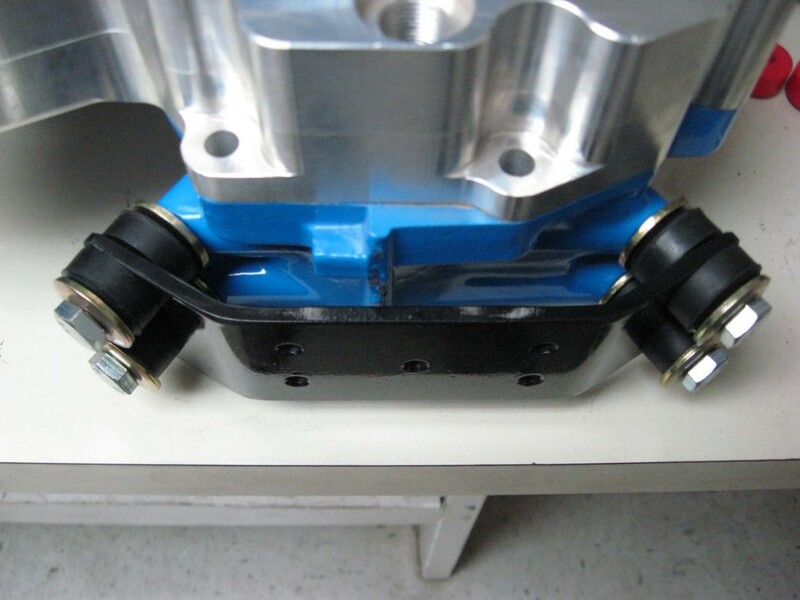 In the end, relocating the mounting holes in the cross member about 1/2″ towards the passenger side, as well as lowering the cross member just slightly, resolved the problems with the Lefty. 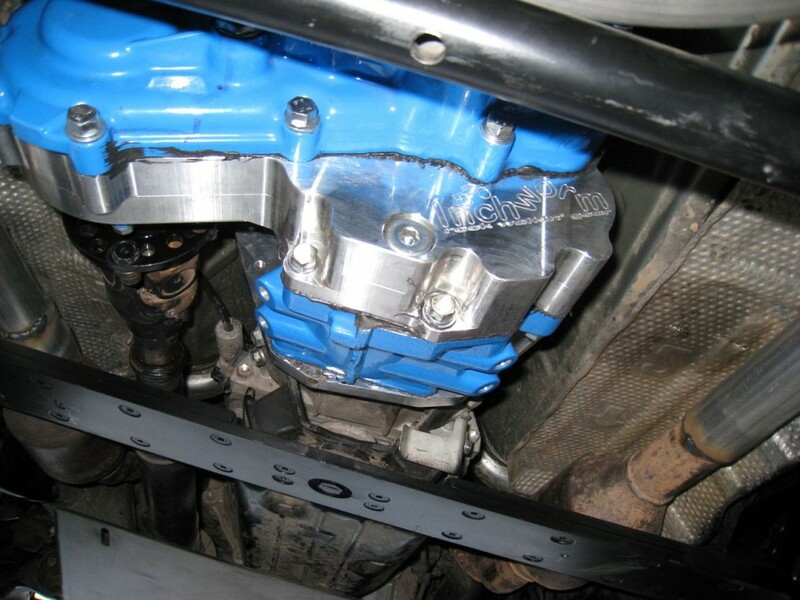 The combination of these two changes provided the transfer case with plenty of clearance even during high-torque situations so there was no need to utilize the additional bolts and mounting plate for the transfer case. 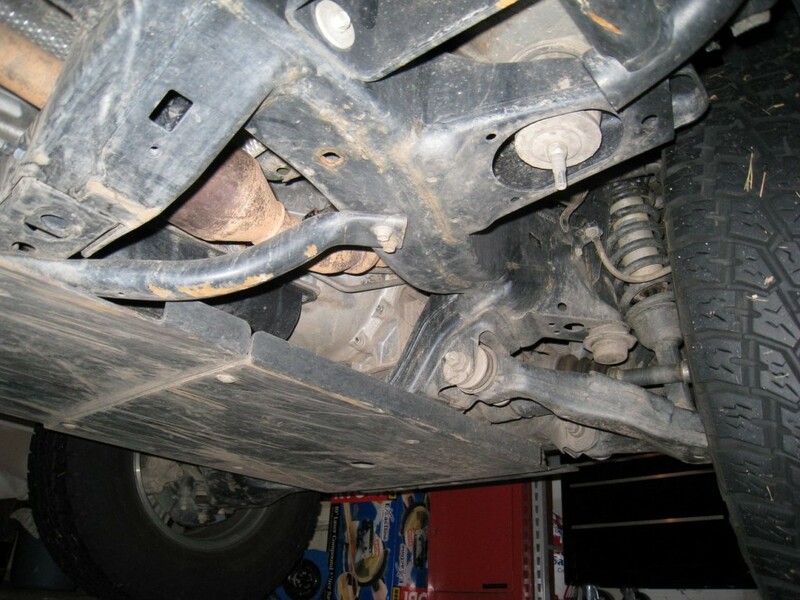 The creaking issue with the link shims was also easily fixed by welding the internal shims together to prevent rubbing. 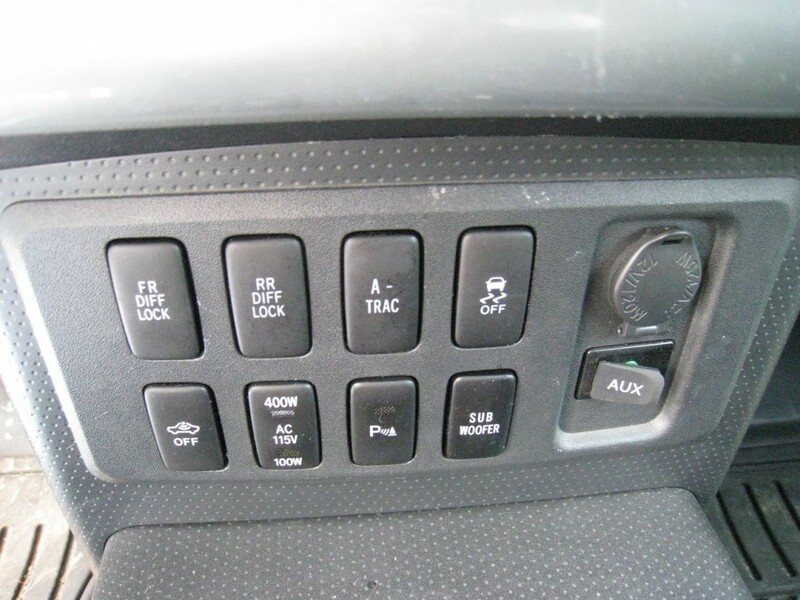 After a lot of troubleshooting, the error codes in 4-wheel drive high range appeared to be based on translation errors between the Lefty and the stock computer system. The circumstances that caused the error were easily repeatable and threw the same code every time. Bud even verified this with several other Lefty users who were experiencing the same problem. Bud and myself have both contacted Inchworm seeking a resolution to this problem but the responses were somewhat lacking. It would be nice to see Inchworm take a proactive approach towards fixing this issue, but unfortunately, it’s been over a year now and the problem has yet to be resolved. Fortunately for myself and other Lefty owners, this issue appears limited to lights and codes and doesn’t appear to have any real mechanical side affects. I’m crossing my fingers that it remains that way. 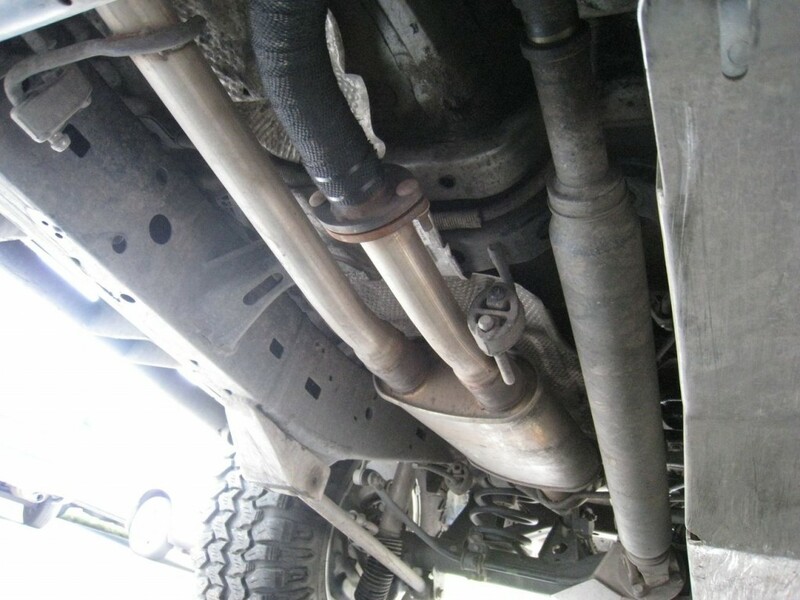 One other modification that Bud made on the FJ’s second visit was related the exhaust piping. 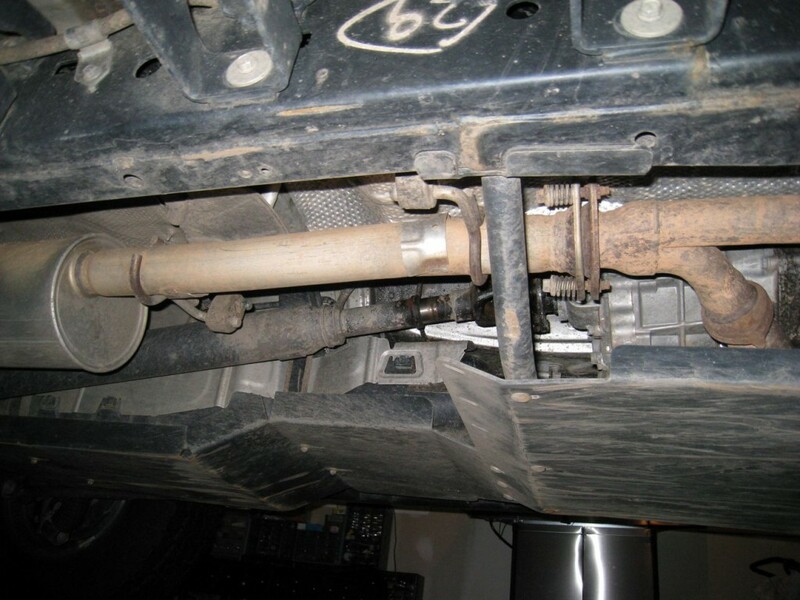 The original (replacement) crossover pipe was a solid piece that had been welded on both ends (converter and muffler). This designed proved to be a bit cumbersome since it meant chopping out the pipe any time anyone needed to access the Lefty. 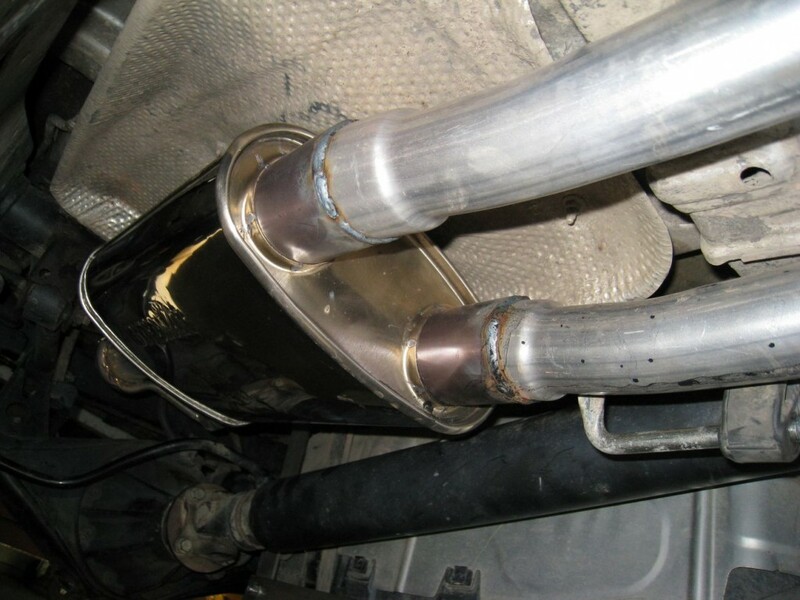 So while the FJ was in residence, he cut out the welded piece, welded in some heavy duty Toyota exhaust flanges, and replaced the welded portion with a separate flanged piece of pipe that could be easily removed to aid in repairs. 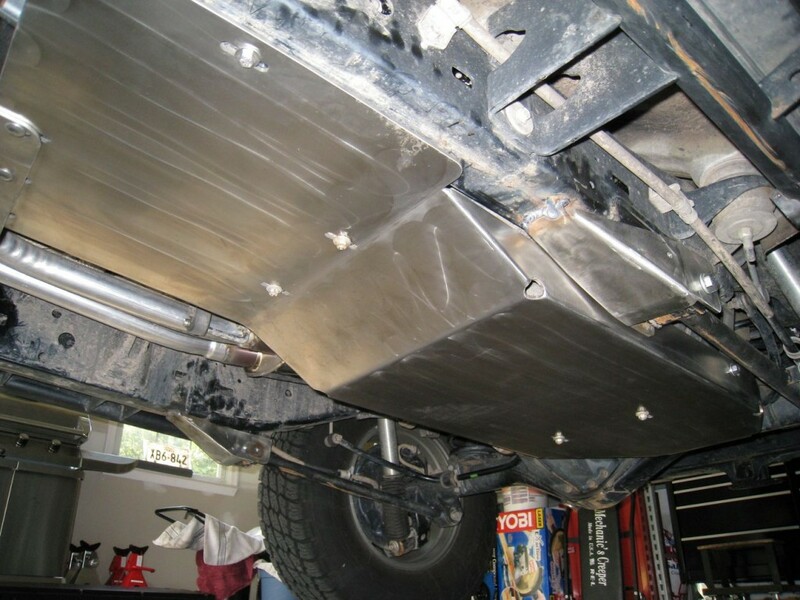 Note: Raising the exhaust piping will result in more heat transfer to the underside of the FJ. 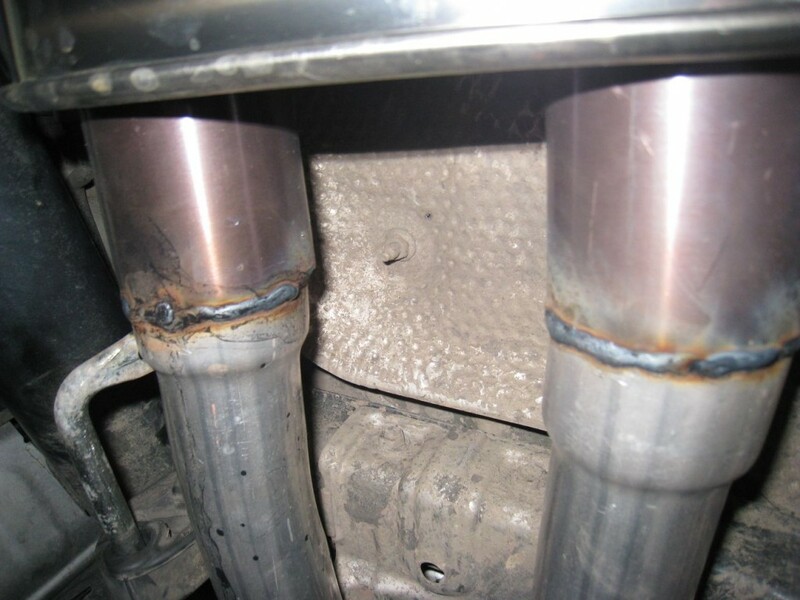 I have since added heat shielding to the transmission tunnel and heat wrap to the crossover pipe to combat this problem. 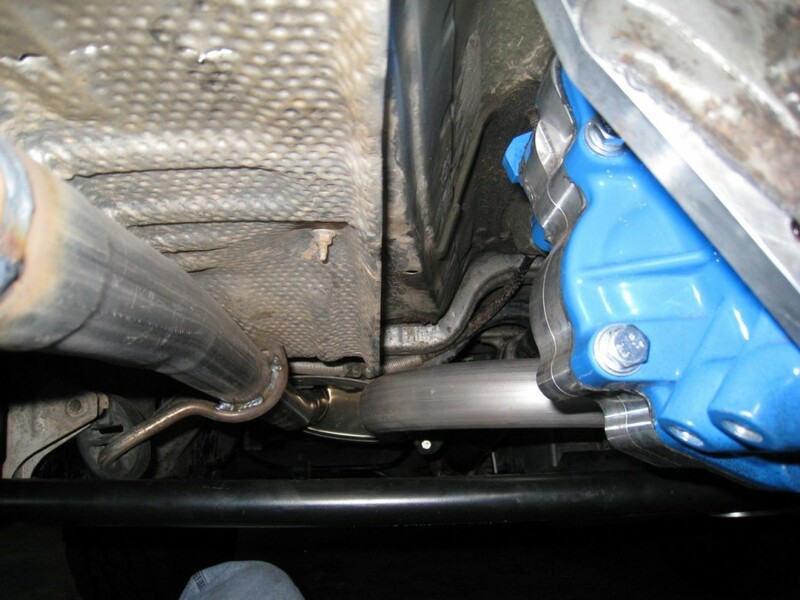 The bolts used to mount the transmission skid to the new Budbuilt cross member were only temporary and were quickly replaced with an allen head bolt that was rounded on top. 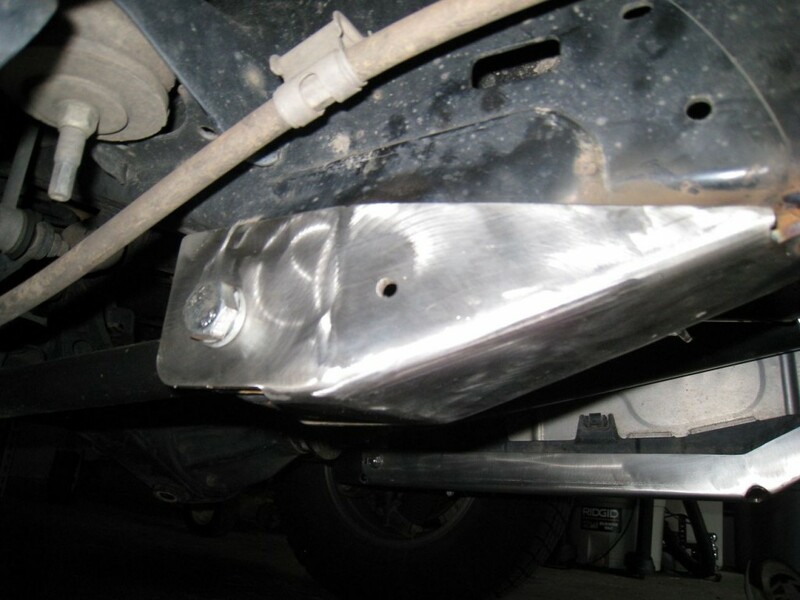 Even though these bolts are smaller and higher up than some of the other skid plate bolts, rocks can be quite clever and unforgiving at times. 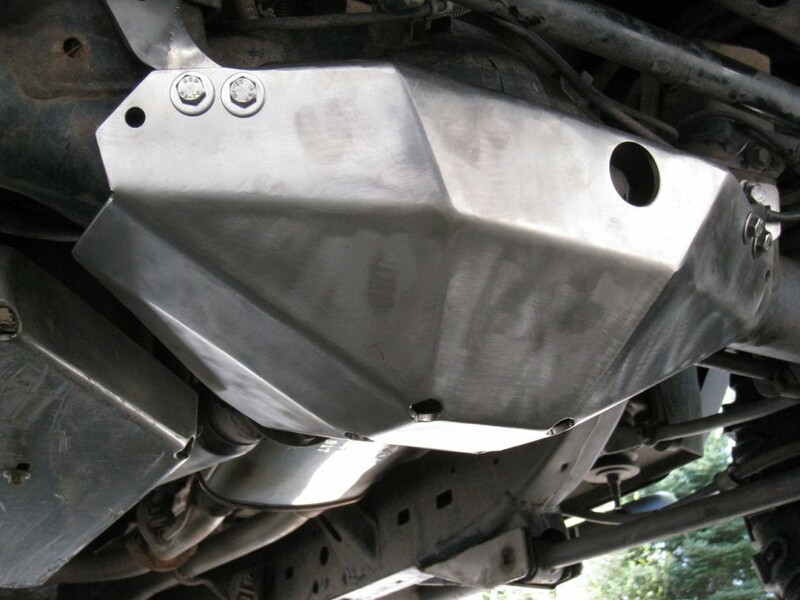 It only took one trip to Rausch Creek to mash and distort the allen head, preventing their removal with traditional tools. I ended up grinding the heads down so that the skid could be removed, at which point I removed the damaged bolts using pliers. 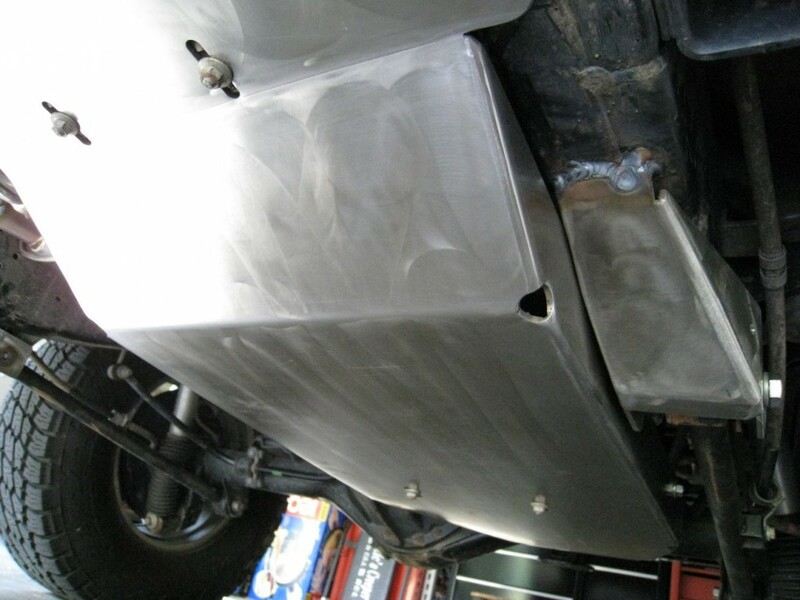 To combat this problem I did a little digging and discovered a local company named Blue Chip Metals that did a lot of custom work with stainless and aluminum. 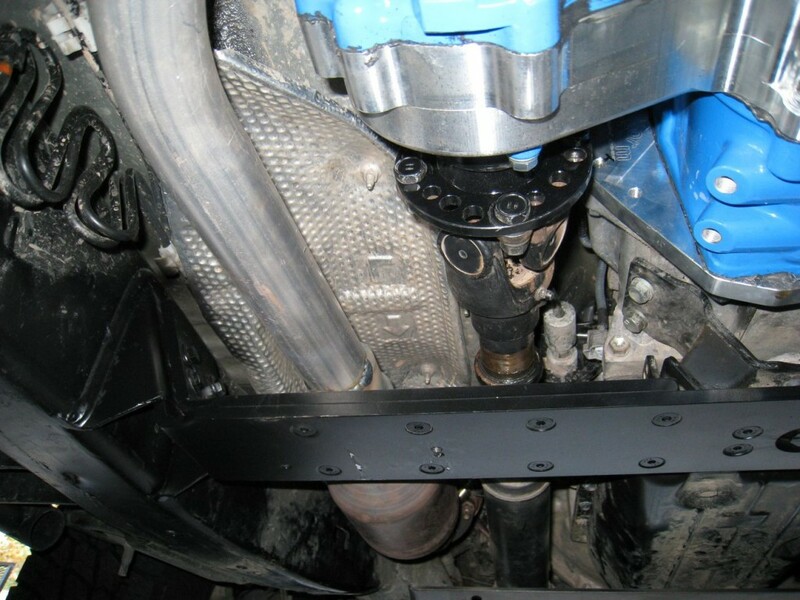 Once I explained what I needed they happily obliged and two days later I was staring at a newly modified transmission skid, complete with machined collars for the cross member bolts. 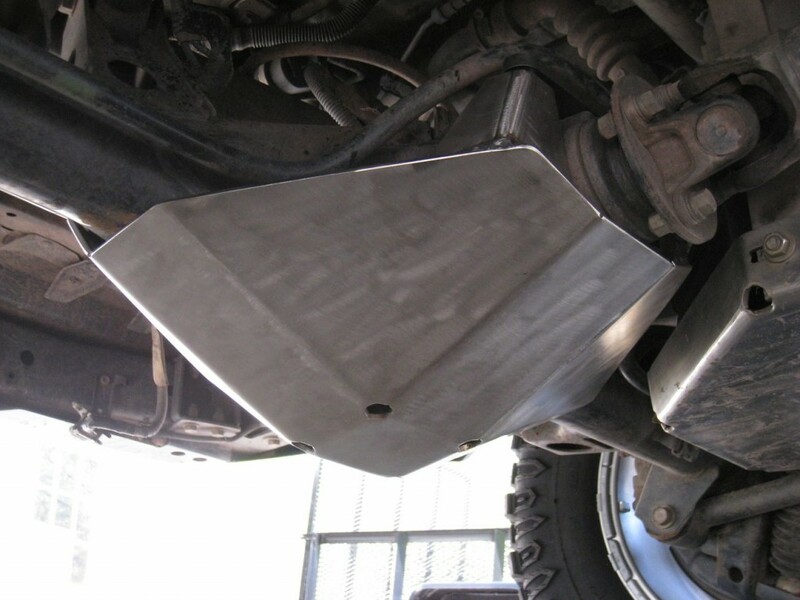 At some point I need to drop the gas tank skid and have these same collars added there as well to prevent damage to the gas tank bolts. I’ve included a few more photos to display some of the changes that were made to components since the initial installation. 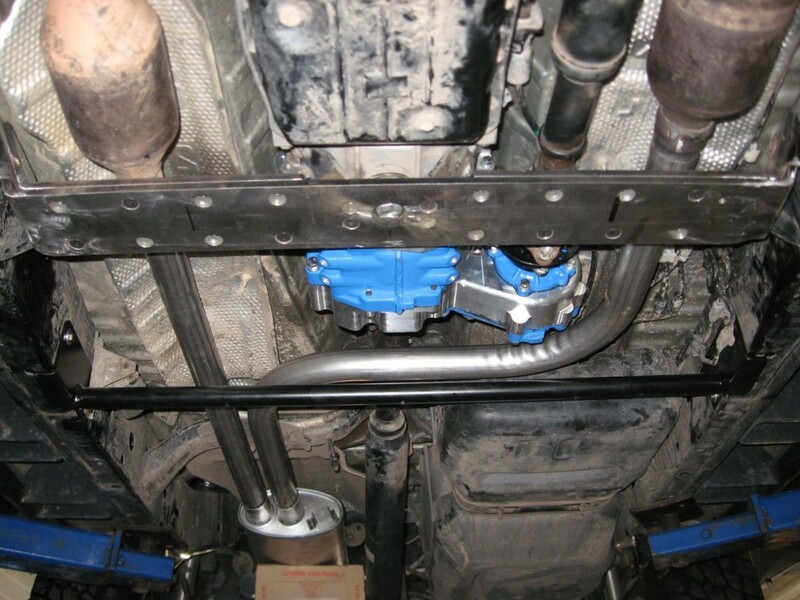 The new cross over pipe is now wrapped with heat tape and bolted into place thanks to Bud’s modifications. 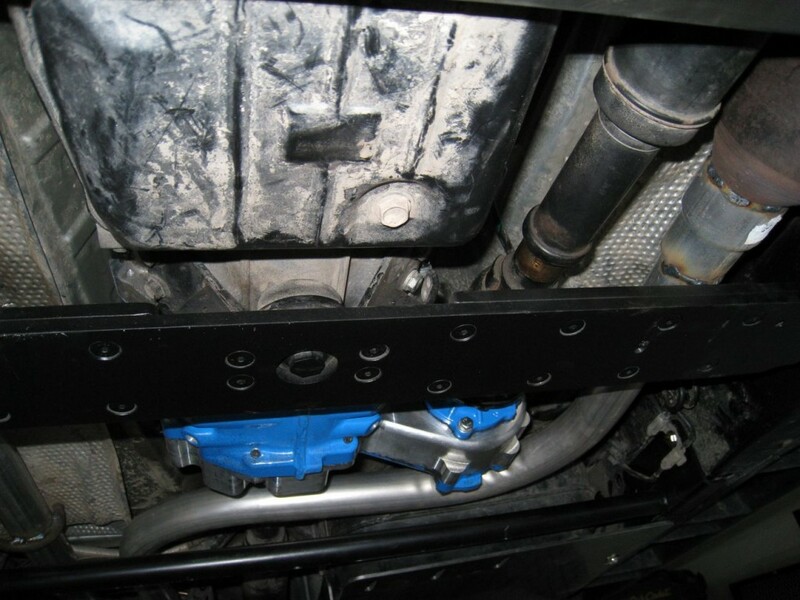 You can also see the 2nd generation cross member with the extra mounting holes and newly added rearward section. 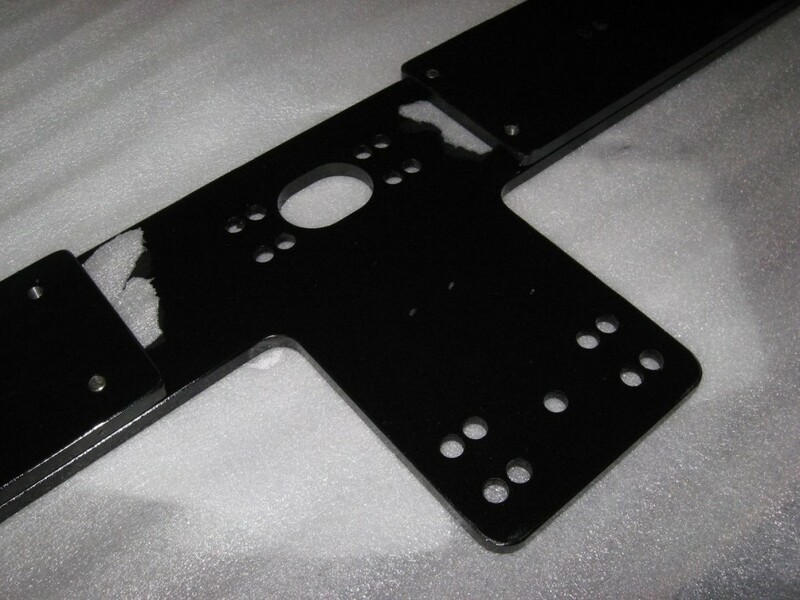 This new T-section of the cross member was designed to work with a custom Lefty mounting bracket (also seen below). I’ve also included some pictures of the machined bolt collars that Blue Chip Metals added to give you a better idea of the final result. I’d like to again take the opportunity to thank Bud at Budbuilt for offering fantastic products and customer service without compare. I’ve never before experienced the amount of dedication that Bud exhibits when it comes to his customers and I am extremely grateful that I’ve had the opportunity to meet him in person. So if you’re in the market for a tummy tuck, or you’re ever near Lenoir, NC, I heartily suggest you stop by and say hello. Fantastic build. I am debating on the single Inch worm versus the doubler. 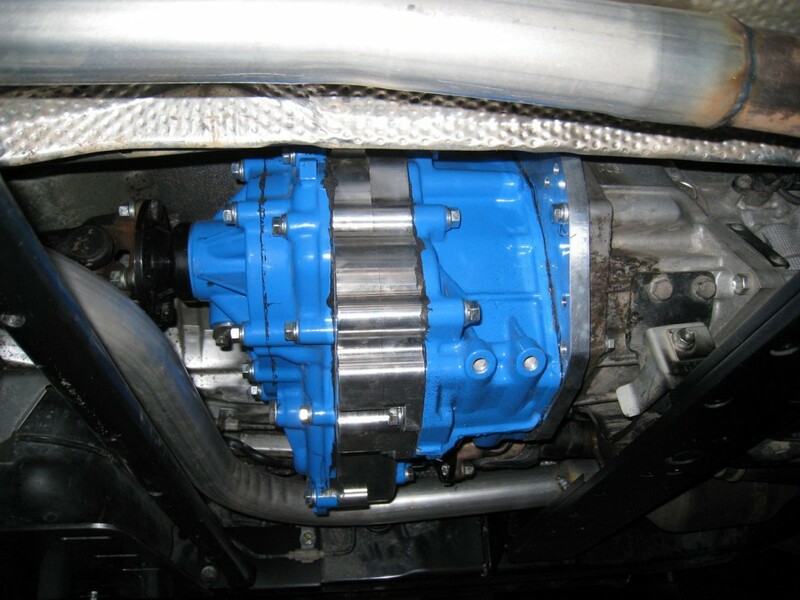 Obviously the doubler has more options for my 6 speed stick but it also applies more torque to the front differential and could snap CV. I only need a rock crawler one month out of the year, and am thinking the single lefty might be better for me. However, we do have a lot of snow and Ice in Idaho. One question. 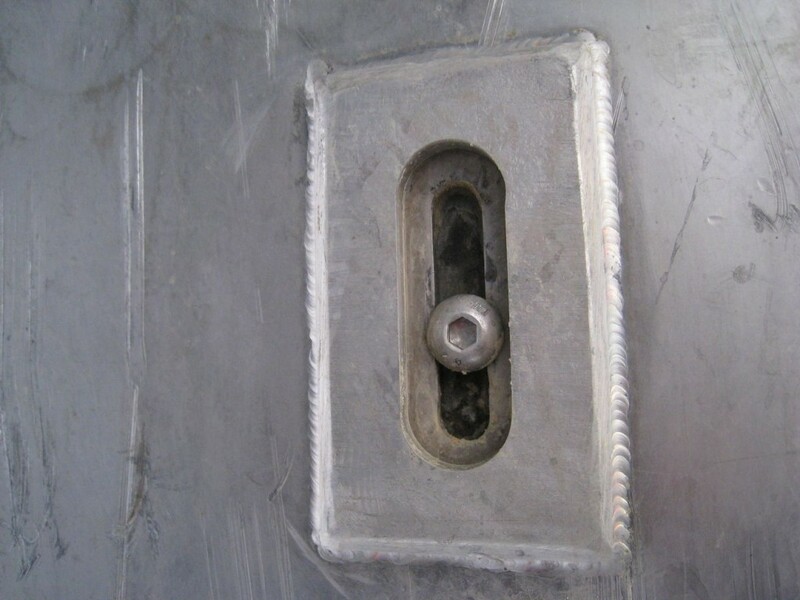 Where did you find those “factory looking switches” to hook up the lefty? Thanks, Jim. The credit for this particular mod is really all Bud’s. I don’t know anyone personally who has installed a doubler yet so I can’t really provide any input on that debate. In my case I wanted to keep the internal cabin area looking as stock as possible so I opted for a single stick configuration and no doubler. As far as the switches go, I actually cheated a bit although you may not be able to tell from the photos. I ended up ordering a second “RR DIFF LOCK” button from Toyota and blacked out portions of the first “R” on the face to make it look like a front diff lock switch. I looked around for quite a while trying to locate an “ADD” button or something similar but I never did find anything. 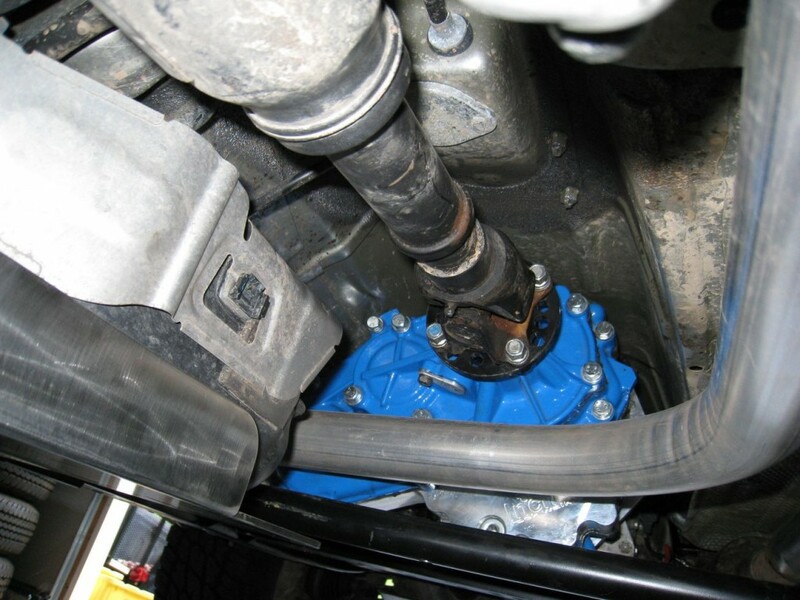 I don’t remember the part number off the top of my head, but I’m sure if you contact any Toyota parts department and ask for the “RR DIFF LOCK” button from an FJ Cruiser they’ll be able to locate it for you. Thank you. I will try to locate some switches. I am getting several conflicting opinions (ain’t America great?) whether to put in the single Lefty or Double on the six speed. We do have black ice and slick covered roads and some are advising the double while others say the single is enough for what we do. I only use the 2008 FJ as a rock crawler while hunting Chukars with my bird dogs one month a year. The rest of the time it is a daily driver. 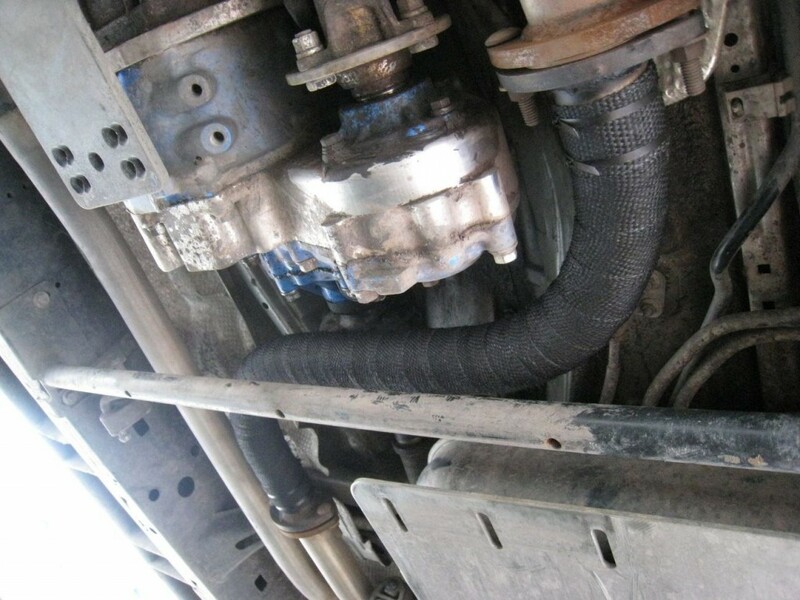 i will install the Lefty myself if it is a single but have a pro do it if we go double (ie, gas tank and drive shaft issues) What is your opinion about the ice and snow issues? Jim, it’s just my opinion but I don’t know if the Lefty is going to prove overly useful when it comes to ice and snow on the highway. 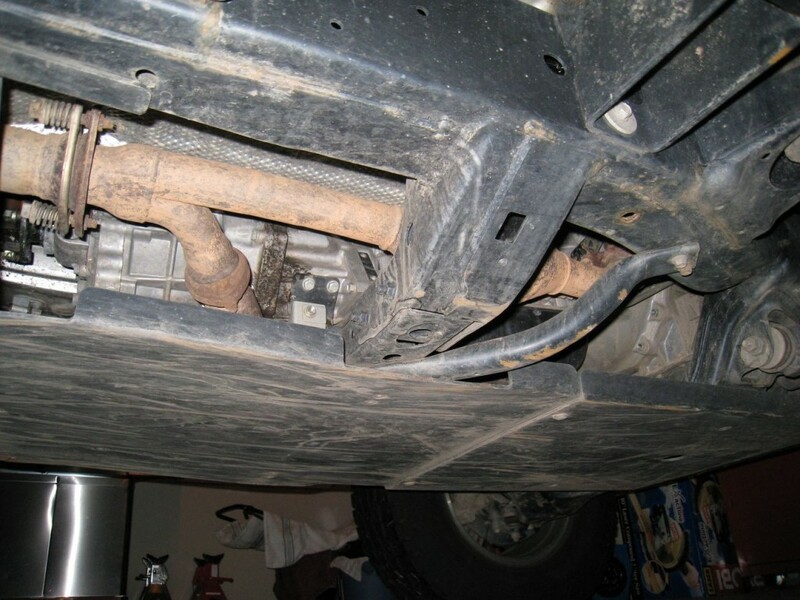 For rock crawling and slow, controlled maneuvers, definitely. 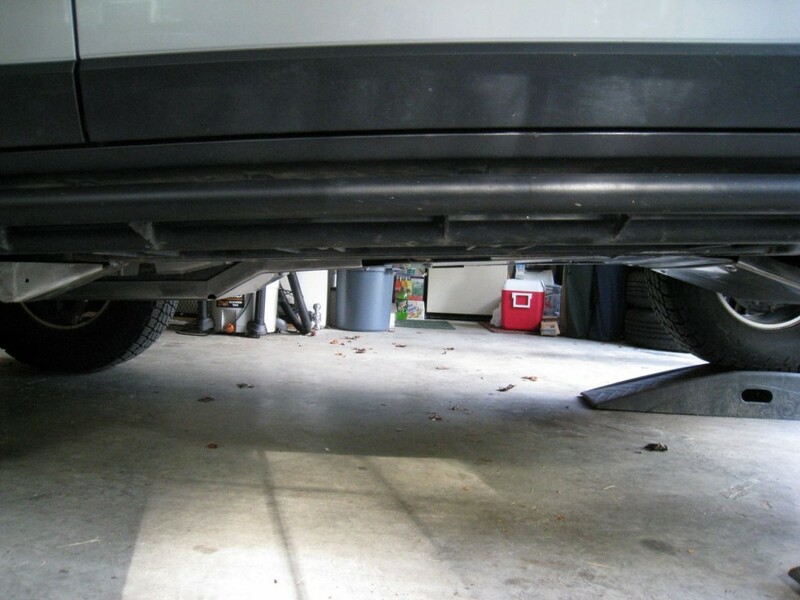 But for road travel where the speeds are faster than 10mph, you’ll most likely be in 4WD high range. 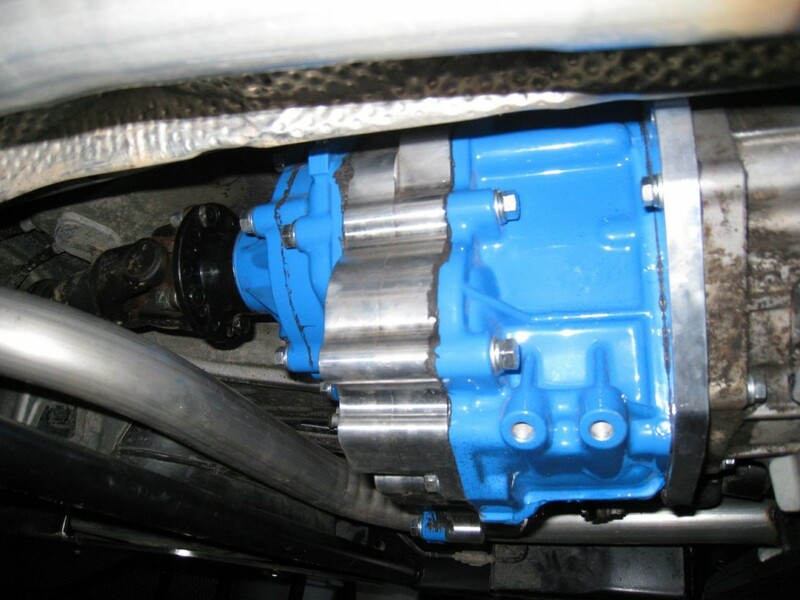 The Lefty high range gear ratio is the same as the stock transfer case so the only real gain for high range (with the Lefty) is that you can still use A-TRAC and the rear locker. 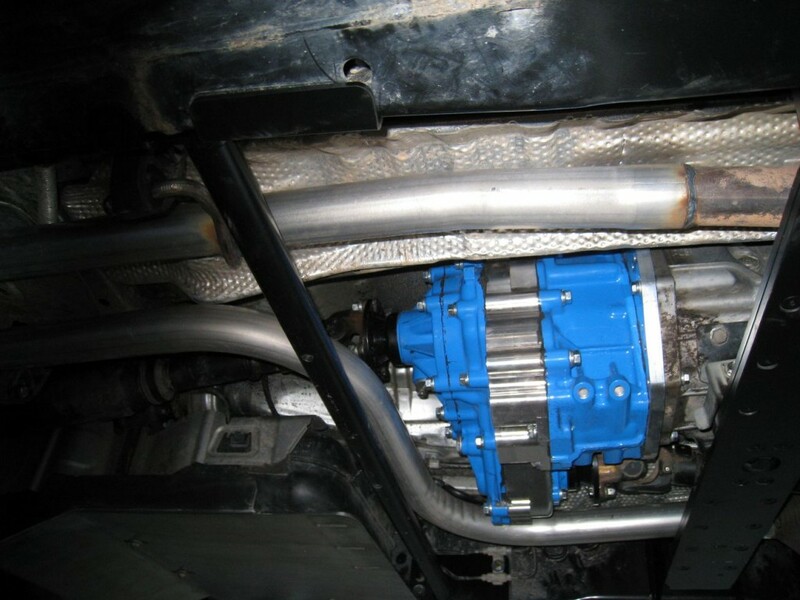 The doubler (AFAIK) will give you lower gearing overall (higher gear ratio) in all modes (2WD/4WD/HI/LO) but it requires more extensive modifications to the gas tank and drive line and adds more to the installation costs. 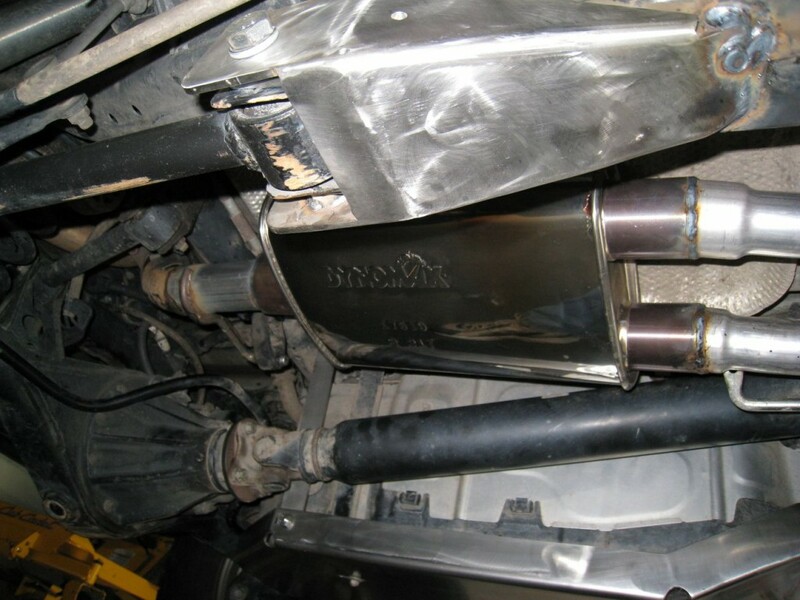 You might try contacting Sbechtold in the FJ cruiser forums or ih8mud forums for more details. I know he had both installed a few years ago and he may be able to provide some better insight as to the benefits of running both. If you are seriously considering a dual cases or a crawlbox I would recommended looking at the Atlas 4 Speed instead. 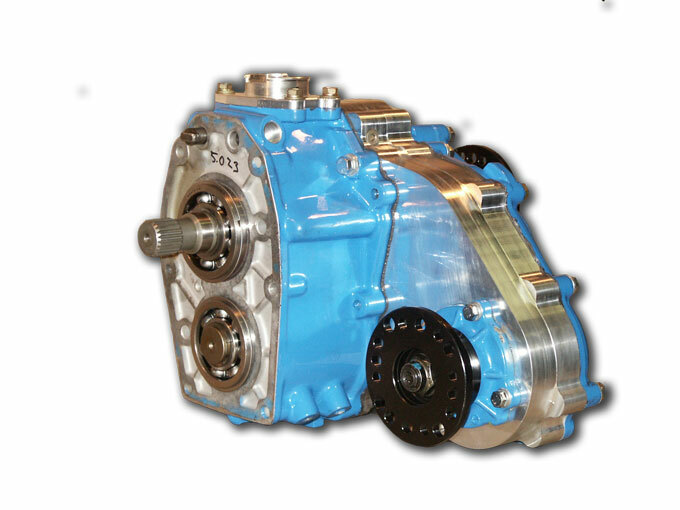 It enables you to have 3 selections on T/C gear ratios 2.72:1, 3.8:1, & 10.3:1. 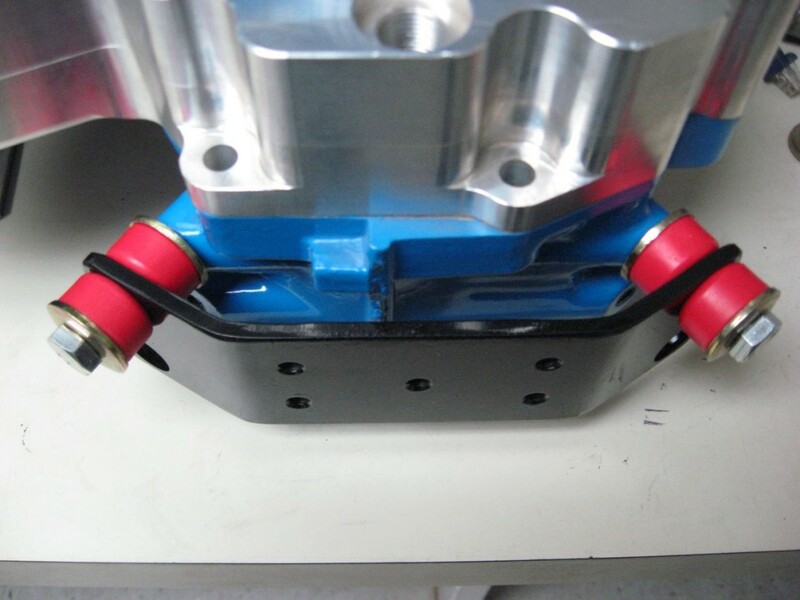 It will require similar modification level as a doubler or crawl box and be more robust than a lefty case overall. 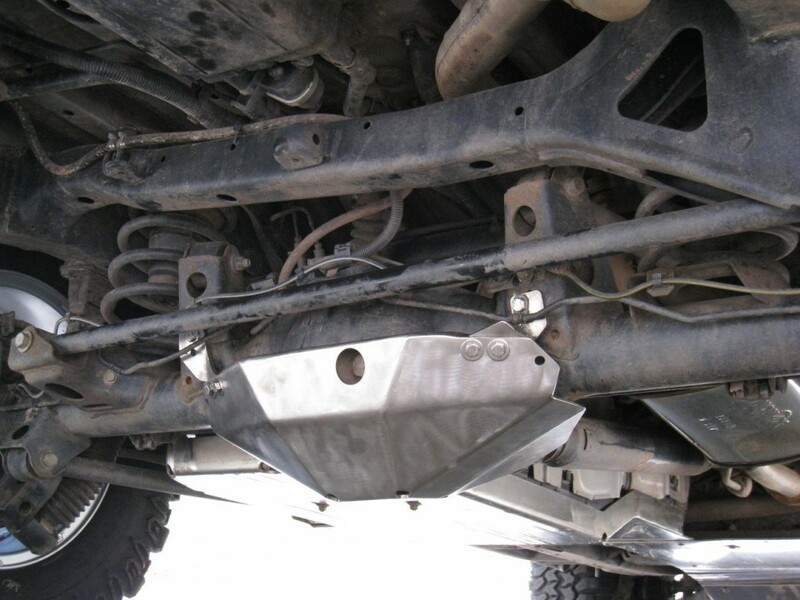 Atlas is what is used in the majority of competition trucks and has a great reputation. 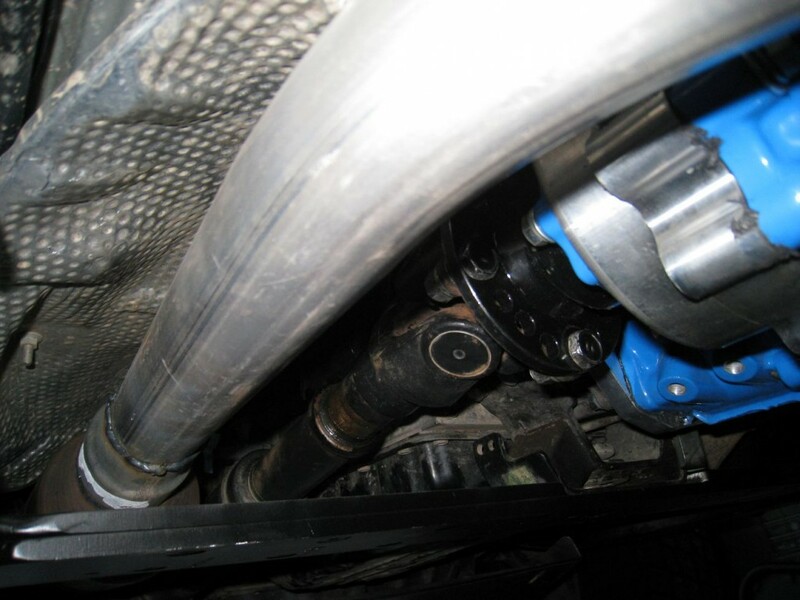 Lefty outputshafts (before they went Chromoly) and recently the 4Lo gear sets have been prone to failure. 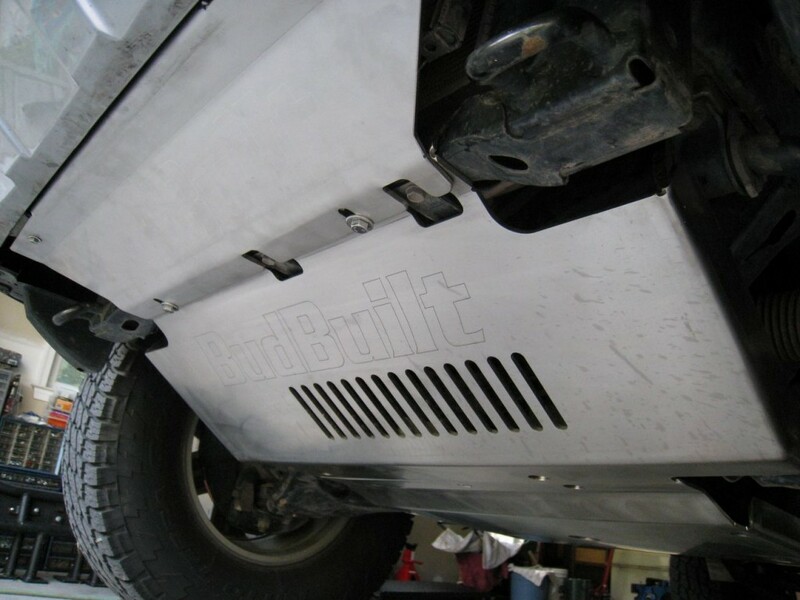 These cases were originally designed for 100hp vehicles which weighed substantially less…not for the weight & hp of a FJ, Tacoma, or 4Runner. An Atlas would be more reliable and robust. If you do go with a Lefty I recommend talking and ordering through Marlin. 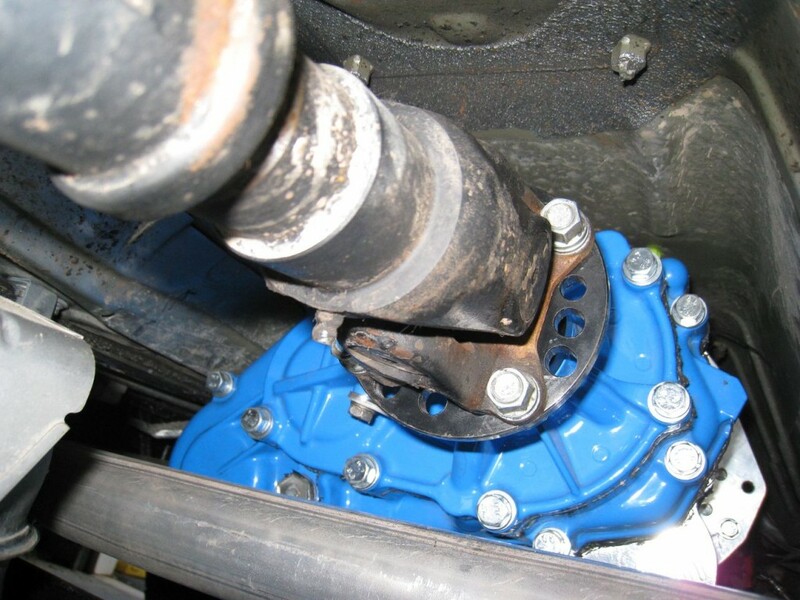 Make sure you get Marlin’s 4Lo Chromoly gear set if you do go the Lefty route. I will probably go with the Atlas because I put in an Atlas 4 speed and Klune low gear drive in a Jeep Wrangler, and I know they are tough. I have been hearing a lot of negative feedback about InchWorm’s lack of Warranty issues. 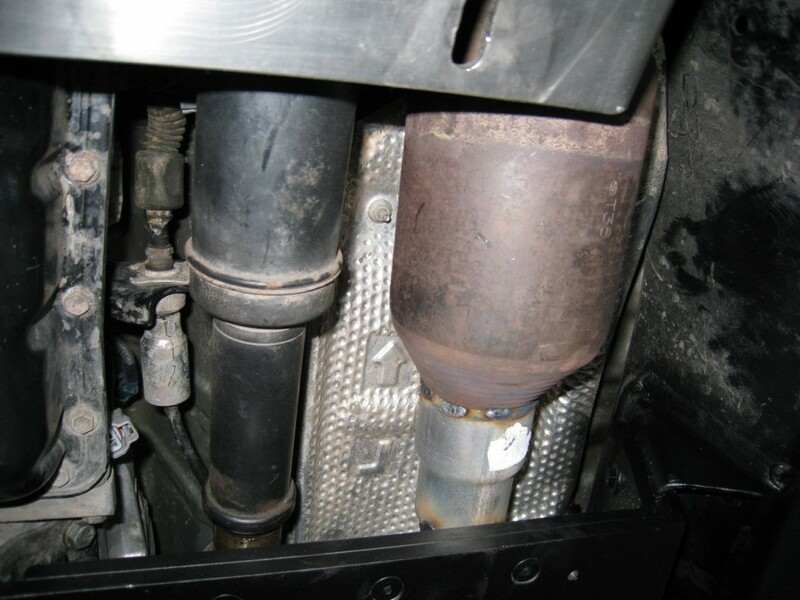 A pity…kiss of death for a manufacturer not to protect his dealers and customers. Having been a fly line manufacturer, I know something about customer service. It is the most important aspect of business. That is why BudBuilt and DeMello are so respected. I am going to try the stock case for a while to make sure it won’t be slow enough for my use. If it isn’t, I’m going to have Jason Demello put the Atlas in.